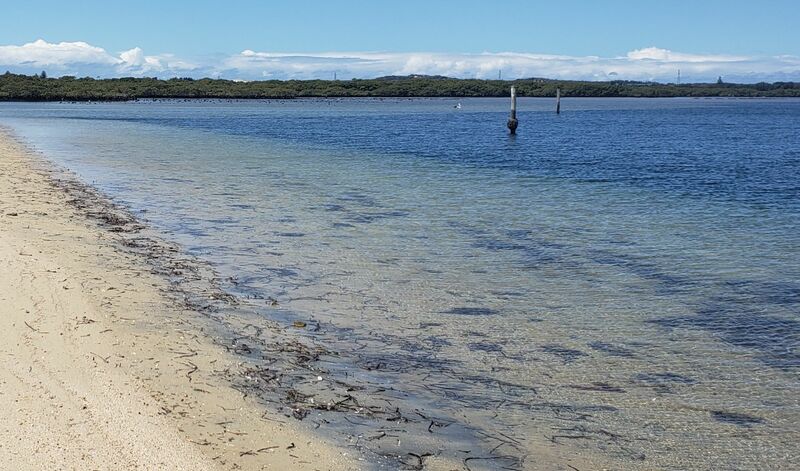 The north shore of Botany Bay is just a few kilometers from our home SE of downtown Sydney. We explored this historic area by driving around the perimeter. We stopped along the way to look for birds, walk along the shore, take a swim, and have a picnic. 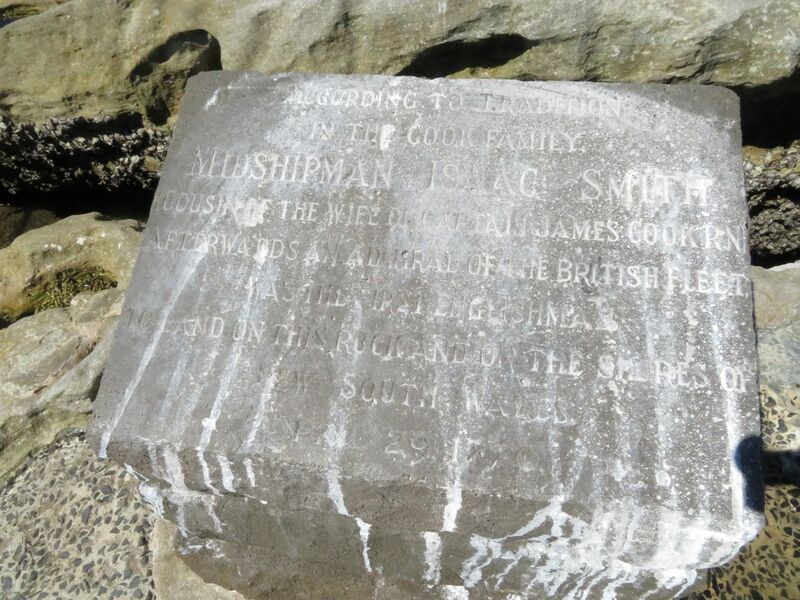 This rock is said to be where Captain Cook’s crew stepped ashore in 1770, the first Europeans known to have landed in Australia (there were probably earlier unrecorded sailors). Cook’s stop led to Britain’s establishing their penal colony nearby, and the rest…is history. I’ve just finished reading, A Commonwealth of Thieves, by Thomas Keneally, describing the founding of Australia and the very early years. It’s remarkable that anyone survived the journey to Australia, and then survived living there in the early days where there was never enough food. 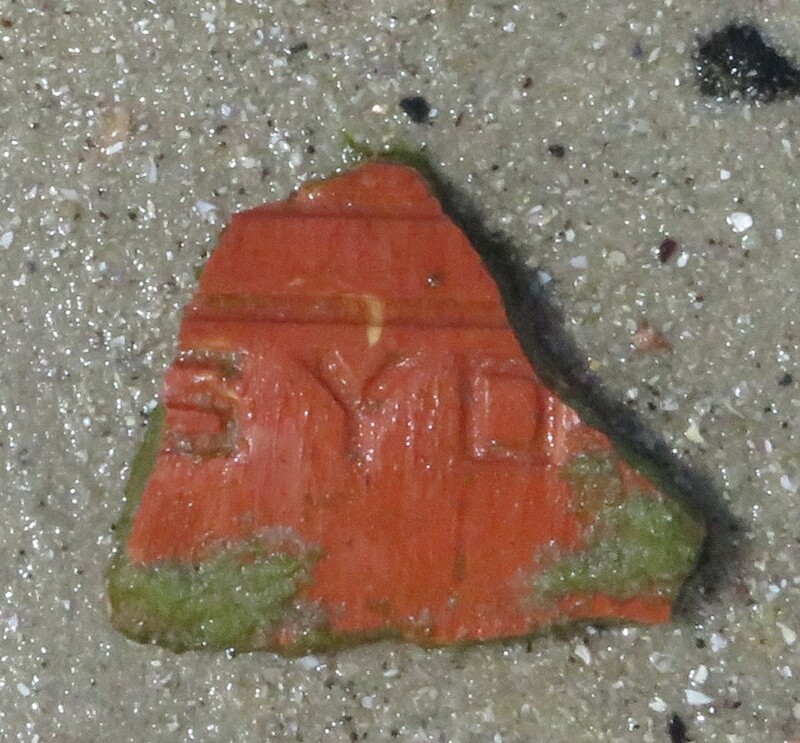 Botany Bay was the destination of the first fleet sailing to Australia, but it proved to be a less useful harbor than the inlet to the north, named Port Jackson, that is now Sydney Harbor. Botany Bay today is lined with huge wharves along the north side and with popular parks and beaches on the west and south. The water is relatively warm and shallow, and we saw everything you can imagine at the beach: sailing, windsurfing, motorboats, jet skis whizzing along, people fishing from boats and from the shore, swimmers, even a few parasailers in the distance. And dogs, lots of dogs accompanying families that set up their sunshades for a day at the beach. Beachcombing turned up a few interesting items, too. Chatting with the man next to me at last week’s concert, I heard about the Surf Capital of Australia–Torquay. We were told about the wonderful beaches and gorgeous coastal drive. 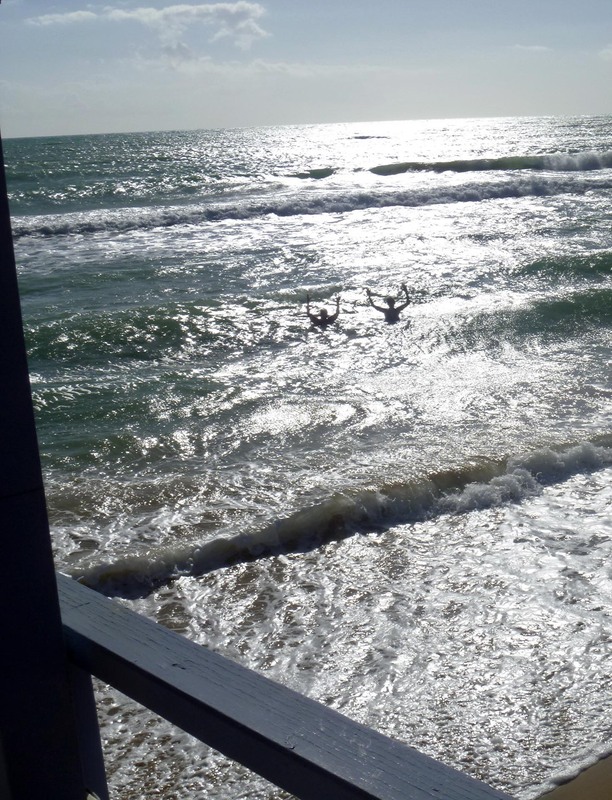 Much as we enjoy Melbourne’s gigantic bay, we had wanted to get out to the ocean, and were convinced. My new friend admitted he was not unbiased, having grown up in Torquay. He lobbied for us to drive at least the portion of the Great Ocean Road from Torquay to Lorne. So we did. What beautiful scenery, beaches, rocks, surfers! Torquay beach was full of surfers and surfing students, even on an overcast day. Shops focus on surf and swimming gear, surfboards and paddleboards are piled up on the sidewalk, strapped to the roof of cars and stuck into the sand. None of our stops beyond Bell’s Beach were in the guidebook, despite being glorious beaches with shelving rock and sandy shores. 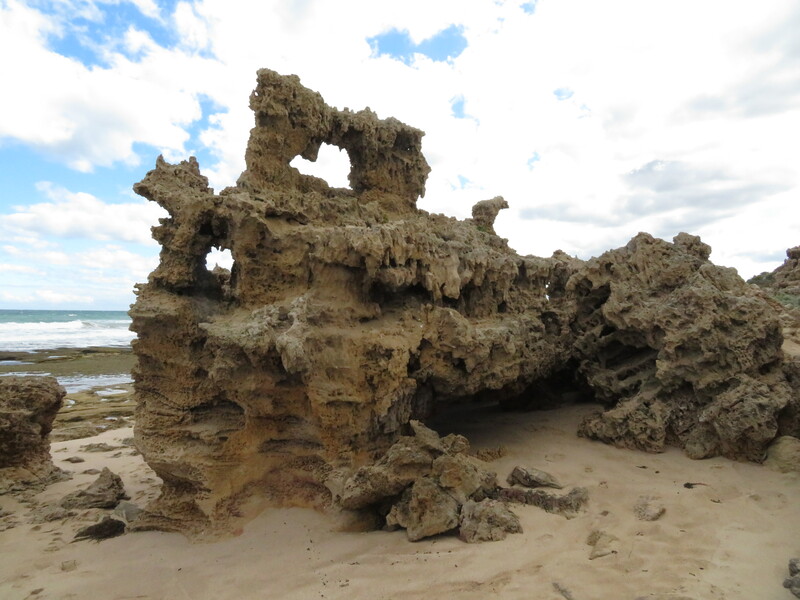 Roadknight Point has eroded rock that looks like ancient ruins, another version of the Library at Ephesus. Or perhaps a pair of giant twins. For sustenance, we stopped at the well-publicized Chocolaterie for ice cream. They have many unusual flavors and a parking lot big enough for thirty tour buses. We were happy to be there on a quiet afternoon. We stopped for the night in Lorne, a beach town with it’s own surf school. At dinner, the young Frenchman who waited on us is at the end of his two-year stay in Australia. He told us of his travels around Australia and recommended the Koala Cafe, “just a little further down the road.” The koalas and parrots in the trees there were irresistible to us. The next morning we agreed that we’d get to the Koala Cafe and then turn back. We did see one koala “in the wild” that was every bit as interesting as the caged koalas we’ve seen–asleep with its back to us. The parrots were a different story. 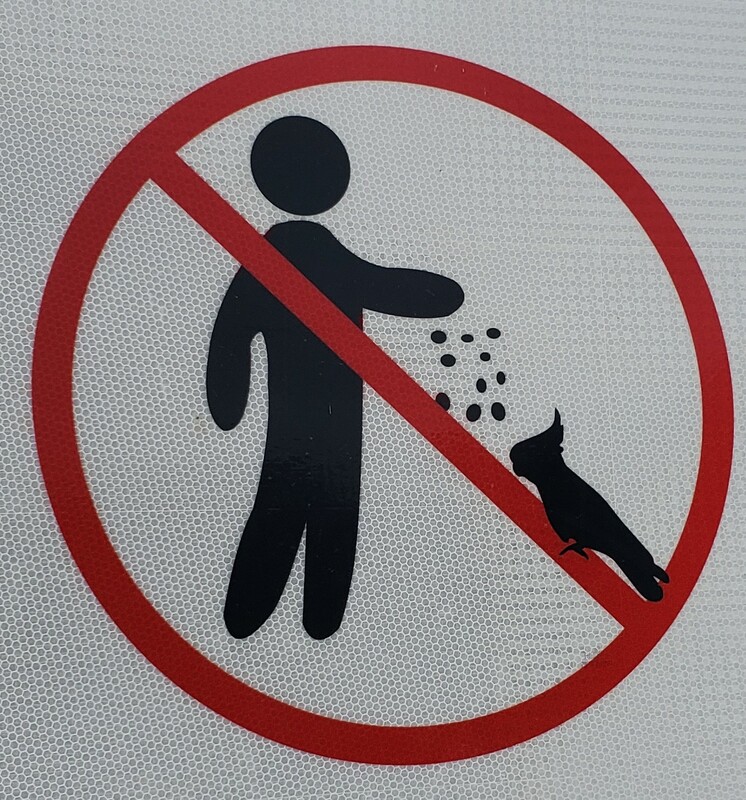 Despite all the signs forbidding visitors to feed them, tour guides pulled out containers of bird seed and filled the hands of all their charges. 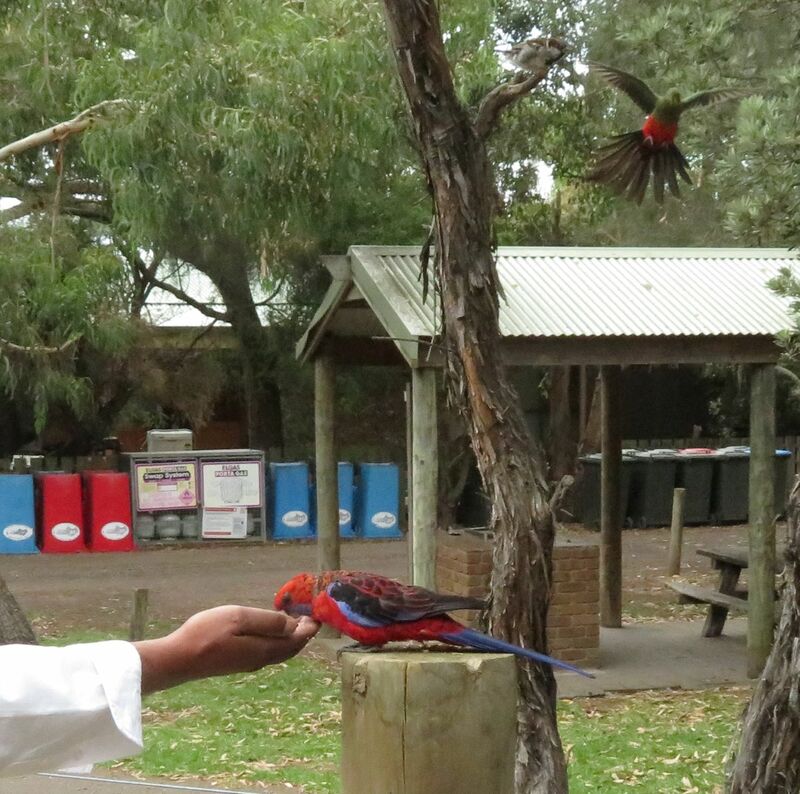 We benefited from seeing King parrots and rosellas up close. 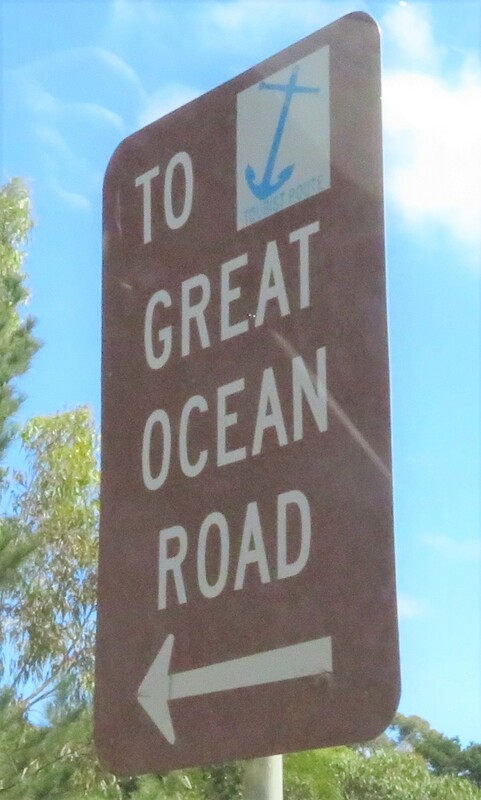 It would be easy to spend the next two weeks making our way along the remaining 350 kilometers of the Great Ocean Road. 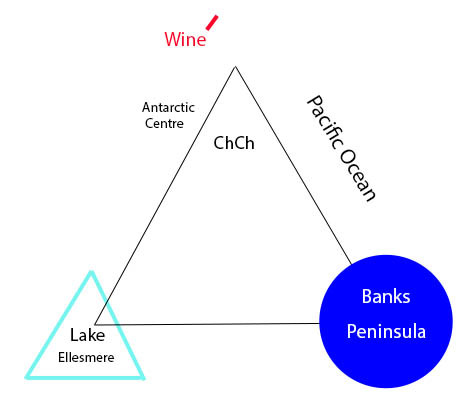 My mental map of Christchurch is a triangle. The city center is near the top. The lower right corner is the Banks Peninsula, an ancient volcano that on the map looks like a huge pinwheel. The lower left corner is Lake Ellesmere, a very large, shallow lagoon that is barely connected to the sea through a gap in the dunes. The Pacific Ocean borders two sides of the triangle with one side (left) firmly part of the mainland. My favorite place in central Christchurch was the Canterbury Museum. It has skeletons of extinct moas, and lots of maori artifacts. The museum is located on the corner of the Botanical Gardens, too, making it possible to visit to both places in one day. Just outside the city center, right at the airport, is the International Antarctic Centre. I wasn’t sure it would be worth the price of admission, yet we had a great time and were there for at least two hours. 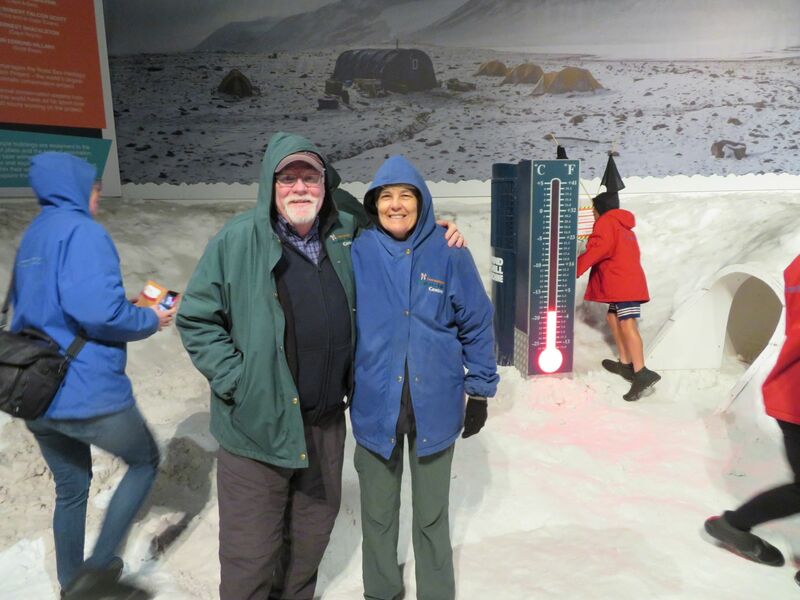 There are excellent exhibits on what its like to spend a research season in Antarctica, the clothing, the housing, even an Arctic storm room that simulates a whiteout. The snow and ice covered room not really as cold as the Antarctic, but it’s very cold. You wear an extra expedition jacket over what you are already wearing, and boot covers. Later, we went for a ride in the tank-like vehicles they drive on the snow in Antarctica, including demonstrations of going up and down steep hills and leaning way over to one side. There are penguins, too, blue penguins swimming in a pool with an underwater window. It was a great visit, and I really liked seeing the US National Science Foundation Antarctic Center right across the street, even if there wasn’t an exhibit there. 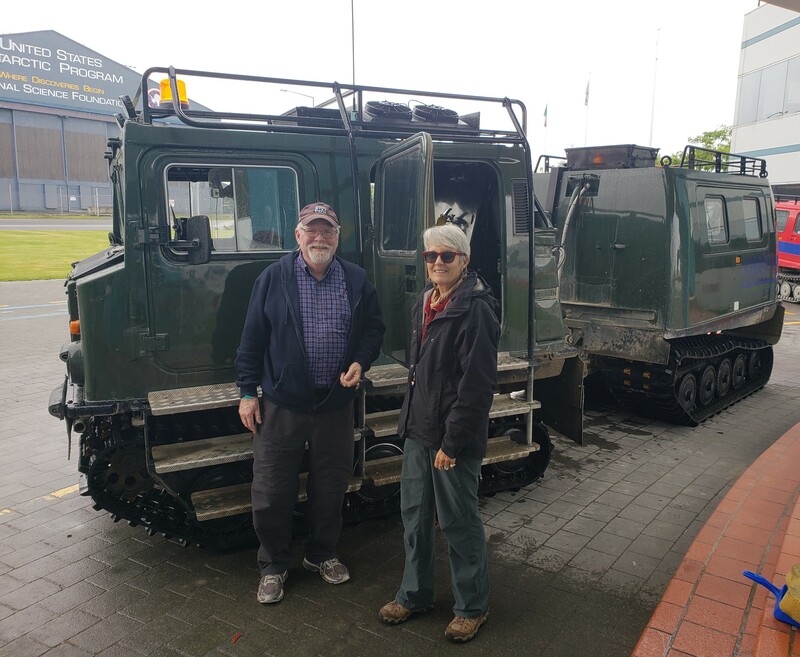 Christchurch is the departure point for all US researchers going to the US Antarctic base at McMurdo Sound, including some of my colleagues from Northern Illinois University. What an adventure that must be! Out on the Banks Peninsula, Akaroa is a small town out known for its brief reign as the French outpost in New Zealand. From Christchurch the drive is at least an hour and a half across two old volcanoes. You see the edge of the crater as you go over the hills to Little River, then across the crater to Akaroa. The town offers beaches, lunch, and shopping, an excellent vacation stop. We were there on a day with a cruise ship visit (! ), which has the benefit that all the stores and restaurants are open, but the disadvantage that they are all full. We left town to look for a place to have a picnic, and ended up in a cove across from the moored cruise ship, watching tenders carry passengers back and forth, while people paddleboarded, jet skied, and kayaked around the bay. The water is cloudy in other parts of New Zealand from glacial dust and runoff that gives it a bright turquoise color. 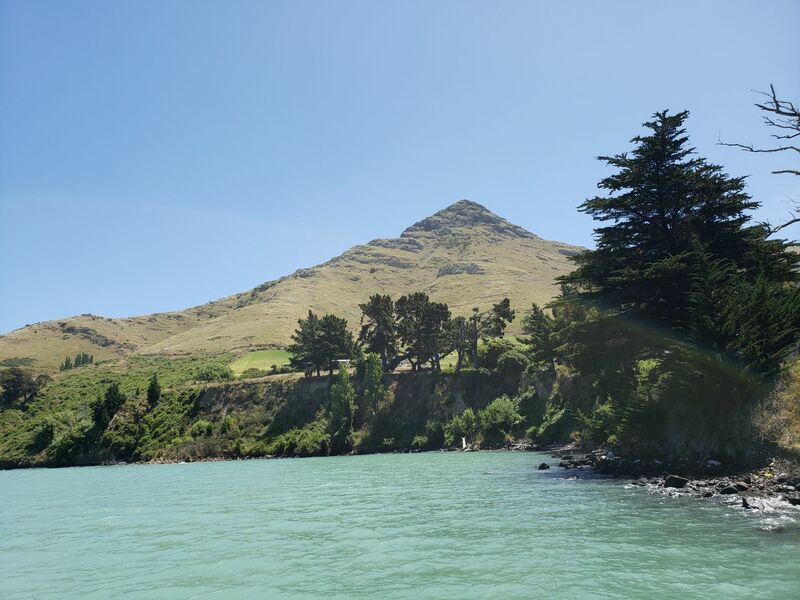 Akaroa is nowhere near the glaciers but the water has the same slightly cloudy bright blue color. 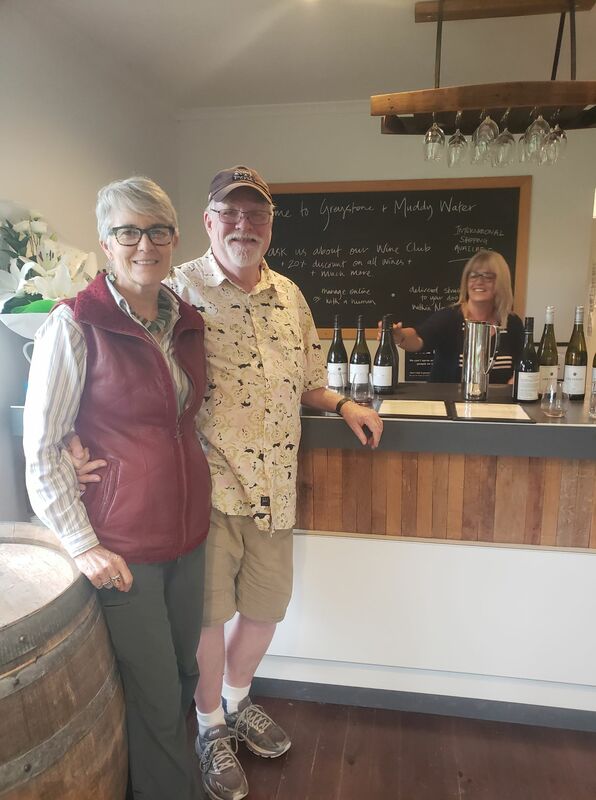 We explored the north edge of the Banks Peninsula in a separate trip around Governors Bay where the only person we met was a young woman at a family reunion nearby. She told us the name of this mountain in Maori. Our visits to the third corner, Lake Ellesmere began coincidentally when we turned off the highway to look at shore birds. We ended up at Birdling’s Flat, a long pebbly stretch of beach. On our way out we stopped at a quirky rock shop and museum and found that many of the pebbles at Birdling’s Flat are agates. Once polished, there are all colors, and the shop/museum displayed thousands of polished stones. This week we moved from the North Island of New Zealand to the South. During the past month we walked on beaches, collected glass, shells, and driftwood, drank coffee at a wonderful local cafe, visited museums and wineries, strolled in parks and botanical gardens, climbed hills, and watched birds. Every day held vivid and memorable scenes. Rather than a list of where we were and what we did, here are some of my impressions. The forest here is many shades of deep green, and dense. The first people to arrive here, both Maori and then European, must have felt an oppressive challenge. Not enough to arrive on shore, newcomers had to make a dent in that dark wall. Despite vast changes in the landscape over time, nature remains a watchword to Kiwis (New Zealanders). It’s not all birdwatching. Nature is a visible presence, even in the large cities. Seagulls complain as boats moored along city sidewalks rise and fall. Yet the people are equally important. 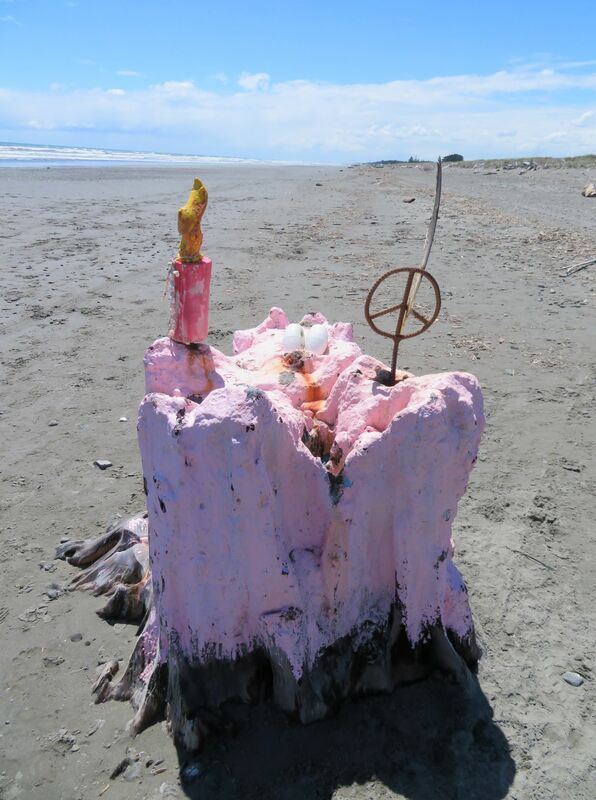 We see personal statements, like the pink stump on Te Horo Beach. In Te Horo Beach, the Bus Stop Cafe is the community center and general landmark, open Friday through Sunday. Kirstie’s famous jam and cream donuts seem to get a lot of neighbors out of bed on the weekend. Kirstie also sells hand made goods by local artisans. When I was at the eye doctor in Wellington, chatting about our stay in New Zealand and mentioned Te Horo, Dr. Long said, “Be sure and stop by the Bus Stop Cafe and say hello to Kirstie for me.” Turns out, Dr. Long spins and dyes wool that Kirstie carries. (And yes, she’s also an opthalmologist and retina specialist.) It’s a small country and everyone multitasks. On a visit to Scorching Beach, Wellington, we saw a cafe with all-out abalone decoration. We admired the range of beaches. Some bloomed with flowers, others were covered with driftwood. Some were ready for surfers, and others were on estuaries that became vast tide flats during low tide. We found intriguing patterns and textures. Some beach finds became part of the decor around our house. We found many things to like in the cities. Museums, botanical gardens, street life, and good restaurants. For us, the appeal of the coast and the bush far outweighs the allure of city life. We gravitated to parks like Zealandia, or the Wellington Botanical Garden, where there were flowers and sculpture at every turn. We have enjoyed every minute on the North Island. Off to the South! We wanted to see the far north of New Zealand. We didn’t get to Cape Reinga, the tip of a long finger of land that points north from the rest of the island, but we got to the knuckles, around Doubtless Bay. One long sandy bay after another stretches along the north end of New Zealand’s north island. 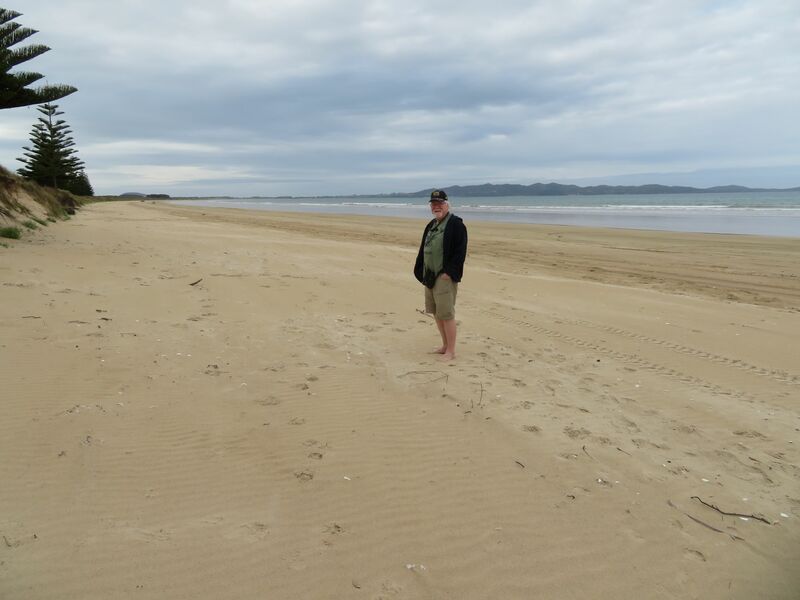 We left our spot on the beach near the town of Mangonui to see Tokerau Bay farther along. When we got there, it was the same gorgeous sand beach stretching for miles. Beachcombing turned up lot of interesting shells, though only a couple of pieces of beach glass. Fragments of mussels and pen shells have iridescent interiors that reflect the sun in stripes of blue, green, and purple. Jonathan found the live oysters growing on the rocks irresistible. We stayed at the Old Oak hotel, built in 1861 as the Mangonui hotel, renovated many times, and lovely. The small downtown area of Mangonui has photos showing buildings that have been in place since the 1890s. The only difference between then and now is that the buggies have changed to cars. 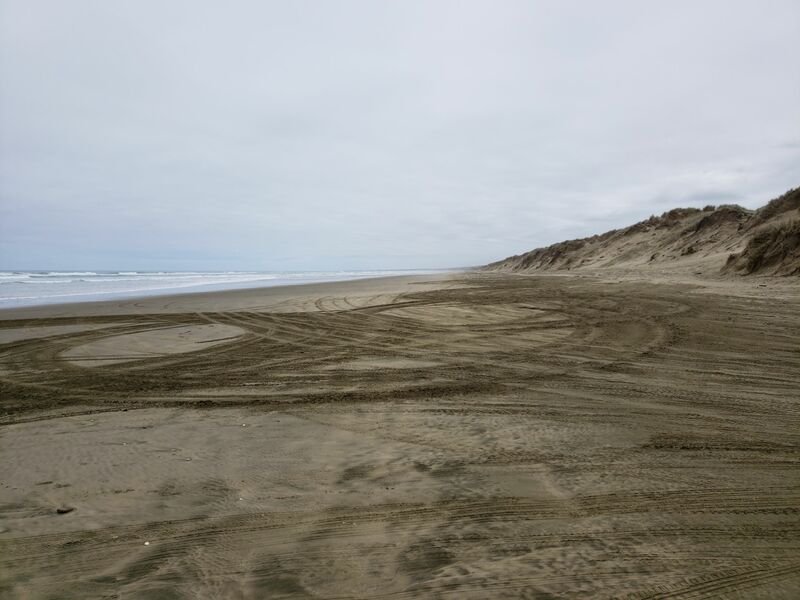 One of our goals in Northland was to see Ninety-Mile Beach. It spans the entire west side of that northern finger of New Zealand. Vehicles can drive the length of the beach at low tide and it’s a popular tour. We didn’t really want to drive for two hours up and then back, so we went for a look, and saw marks of the wheelies on the sand–at the end of the tour? Jonathan found people clamming along the shore and wanted a bucket so he could take home his own clams, but we’re not going to be home to the stove for two days and that might not be good for either the clams or for us after eating them, so we watched enviously while they worked. I admired the work of the woman who was clamming with a bucket in one hand and her cane in the other. That’s spirit for you. Our chief souvenir from 90 mile beach was a flat tire. We changed the tire in record time and when we stopped at a wood carving shop just down the road, a woman directed us a few hundred yards to Awanui Tires. According to the young man fixing tires (tyres), the Monday morning rush had just ended and we chatted while he fixed the hole. He held up a strange piece of metal, neither bolt nor screw, that made the hole. We shook our heads and thanked the two men. The entire process from flat to fix had cost us less than an hour. We understood most of what they said…..New Zealanders can speak their own language when they want to and tourists–we’re on our own. Last stop in the north was Whangarei (Fhan-gar-ey) the only city north of Auckland. Highlights included the Town Basin area where there is a sculpture walk along the water and shops and galleries selling beautiful local crafts. Polished and carved wood and resin from the kauri tree, distinctive and now rare, was one of the highlights. Among the sculptures in the downtown area of Whangarei is an unusual small building covered with colored tiles and mirror. This turns out to be a prototype of materials and forms to be used in the Hundertwasser Museum. Hundertwasser was an Austrian artist and architect who was captivated by New Zealand and moved here in 1975 and spent the rest of his life near Kawakawa, outside Whangarei. I became aware of Hundertwasser’s imaginative paintings when I was in college. He drew floating cities with forests for roofs, presaging green roofs by quite a few years. He turned to fanciful architecture, building structures in Europe that resemble the work of Antoni Gaudi. He designed public toilets for the town of Kawakawa, a project that proved to be his last. Now, after years of public debate and fundraising, the Hundertwasser museum is under construction in Whangarei, to open in 2020. On our way out of town we visited the Quarry Arts Center where a number of artists have studios in a delightful tiny neighborhood filled with sculptures of all kinds..
We ended up at Kiwi North, SW of Whangarei, to see the kiwi. They live in a controlled environment that leads them to believe day is night so they will come out to eat. What funny birds! They look like the back half of a cat with a long beak in the front that they use to snuffle about in fallen leaves. When startled, they zip back into their cave-like nest. 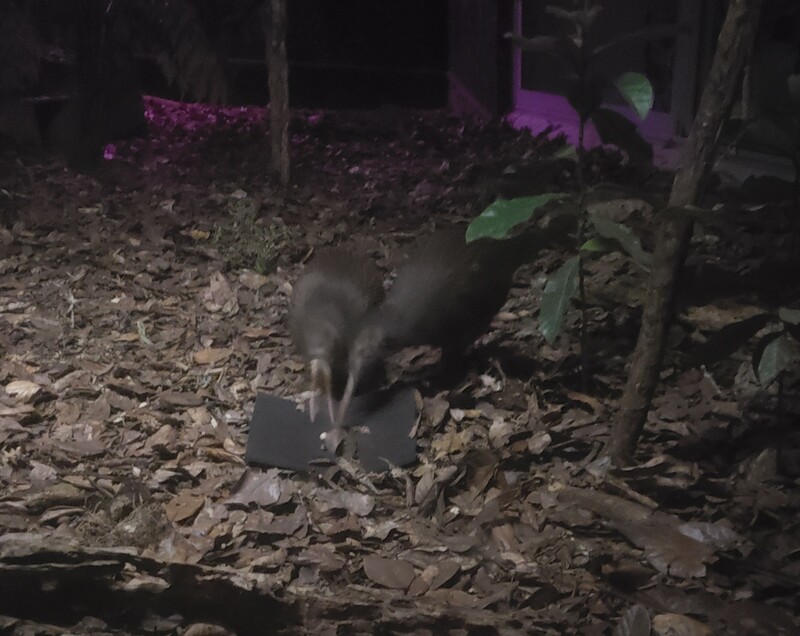 We watched them in the dark until a keeper brought out food. That drew them out into what little light there was. After eating, the pair scuttled back into their burrow and we went on. Kiwi North is a central place for culture in Northland, including historic structures moved from elsewhere, a small museum, rotating exhibits, the kiwi, and a series of regional museum/clubs including medical equipment, old cars, rocks and minerals, and others. These are not open on any particular schedule, but the campus-style setting provides a place for aficionados of different things to have a clubhouse/museum. It looks like a good arrangement for all. Looking through a hollow log. By this time, we had to make our way back to Piha. We packed a lot of looking around into a few days in Northland. There’s lots more to see–we missed the Hundertwasser toilets in Kawakawa! That will have to wait for another time. Boarding a ship in the Galapagos puts you in a different world. Your cabin is compact, the windows and decks reveal water everywhere, the ship rolls, and you rapidly become accustomed to constant movement underfoot. I didn’t get seasick, and enjoyed most of the motion. Being surrounded by water was a pleasure. Any free time we had could be spent staring at the sea, waiting for a dolphin to jump or a turtle’s head to emerge for a moment. In the distance whales spouted. While we were having lunch looking out over the water, a huge manta ray leapt into the air, somersaulted and slapped back into the water. I couldn’t believe it. The biggest plus to our visit was having two of our children and one’s partner, along. They made it much more fun, and it was a pleasure to have time to sit together and chat. We tended to stick with the kids, wanting to soak up as much time with them as possible, so we may not have been as sociable as we should have. Other people on the trip all had interesting stories and I was always impressed when I got talking to one of the other passengers. Everyone had traveled different places, had interesting careers or hobbies. It was an excellent group. We cruised the Gapalagos on a relatively large ship the Lindblad/National Geographic Islander, with room for 48 passengers. Perhaps because of the season, the boat only carried 29 passengers, so there was always extra space in the dining room, the lounge, and on deck. It was the best possible cruising arrangement. Larger ships like ours are able to travel further, and as a result we managed to visit both Isabela and Fernandina Islands, a trip that would take too long for a land based group to reach and might be too rough for a smaller vessel. In addition, we stopped at N. Seymour, Rabida, Santa Cruz, and San Cristobal. 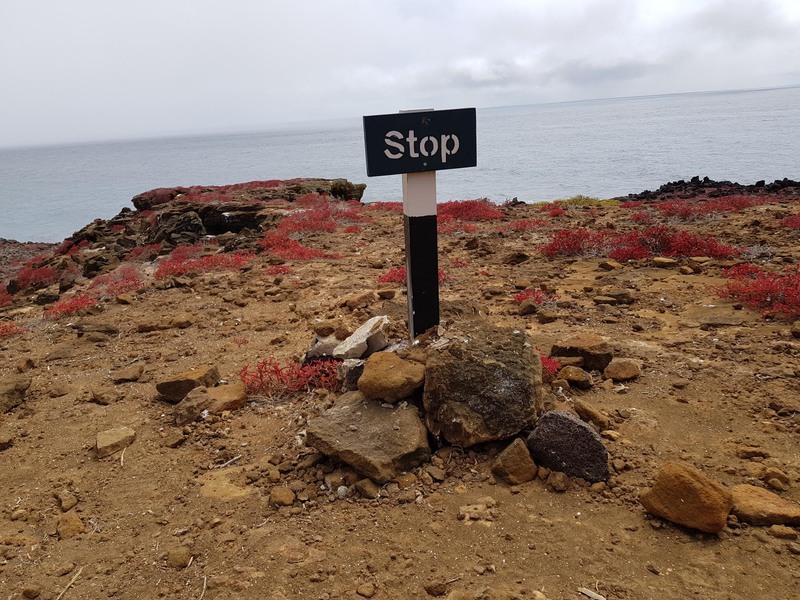 We did not stop at Floreana, however, the island with the famous mail box (You leave a letter and perhaps take one going to a destination near you to deliver/mail). By far the best way to see the Galapagos is by cruise ship. Not only can you see more of the islands but you don’t have to pack and unpack every day or two. All your visits are already scheduled, permissions applied for, fees paid. These are significant advantages. With all the advantages we had, I still have to say that I don’t enjoy organized tours. Sometimes it’s the best way, or the only way, but overall it’s not my favorite mode of travel. I am not a cooperator. I dislike mandatory timetables, even when I benefit from them. That is, there were two or three time slots for activity each day. Often the early slot was a walk, which I usually skipped to sleep in. Each of the other time slots offered two activities, one in the water and the other a hike or boat ride. There was always something for those who didn’t want to get wet. Scheduling all this meant that people had to wake up and have breakfast at specific times. Some announcements over the ships PA system could be muted, but many were mandatory and broadcast in all cabins and public areas. I found it difficult to accept that these were necessary. Our cabin was the best on the ship, large and comfortable, the best bed we’ve had away from home that I remember. We had great views over the bow of the ship and off to the starboard side, as well as seating areas and a desk. We had a real shower in our bathroom, not the mini shower that wets the entire bathroom. Staff straightened up three times a day! They left us chocolates every night–it was fabulous. The pictures of our room show how good we had it. Though the other cabins were much smaller, the public spaces were very nice, and with a smaller than average number of passengers, there was plenty of space for people to spread out and avoid spending time in their cabins during the day. In addition to snorkeling and bird-watching, I went stand-up paddleboarding and looked at a animals at the same time. 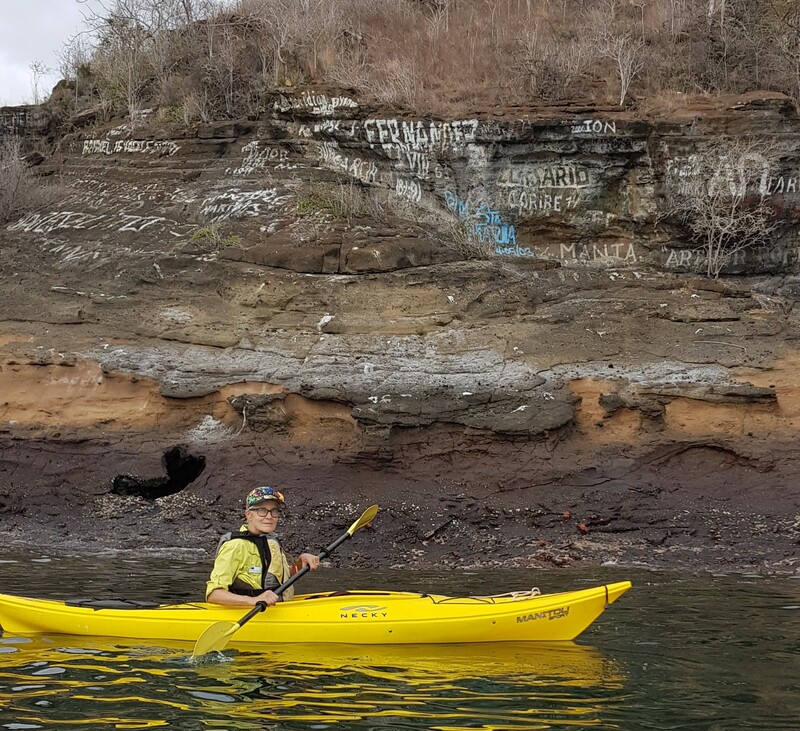 Another day I went kayaking along the coast and saw graffiti that has been left behind over the years. (It’s not permitted today.) 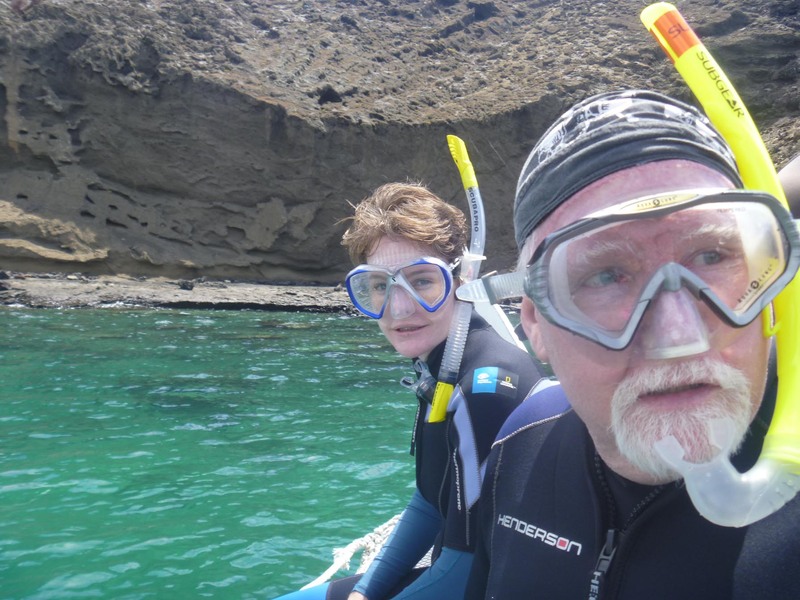 Add snorkeling and boat rides and we were busy all the time and we knew what to do, very important in the Galapagos. There are lots of rules, one of which is that you cannot visit most places outside the towns without a guide. Each tour receives permission to visit specific places at specific dates and times. 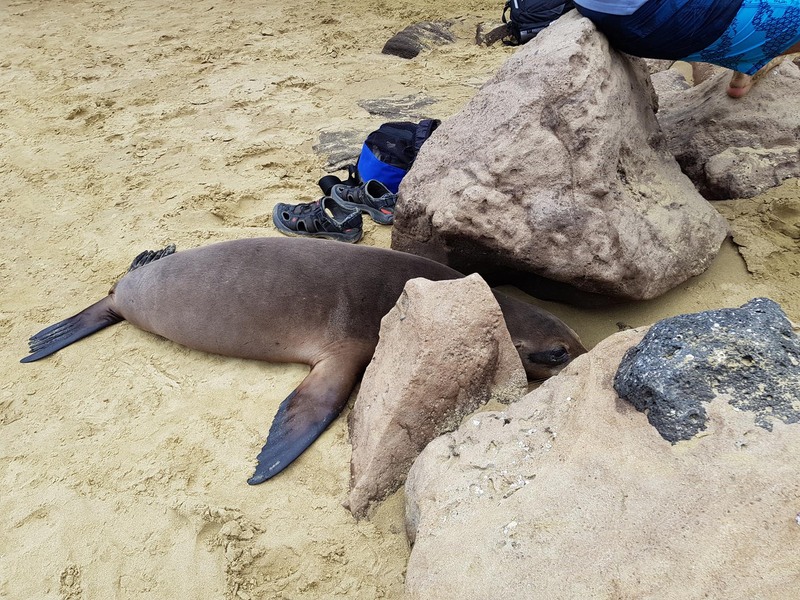 There is no pulling in to a pretty white sand beach to explore, as large areas of the Galapagos are closed to anyone without a specific research permit. It’s limiting, but also protective. No plastic is allowed, even on cruise ships. I appreciated the effectiveness of the Galapagos rules and regulations on the beaches where there was no trash at all. Not any. In a full week I found one tiny knot of nylon rope (1/2″ clump), Jimmy found a Gatorade bottle, and we saw a floating apple core and two halves of an orange. That was it. I have not been on such clean shores in many years. We had guides who were qualified at the highest level, all Ecuadoreans who speak English. 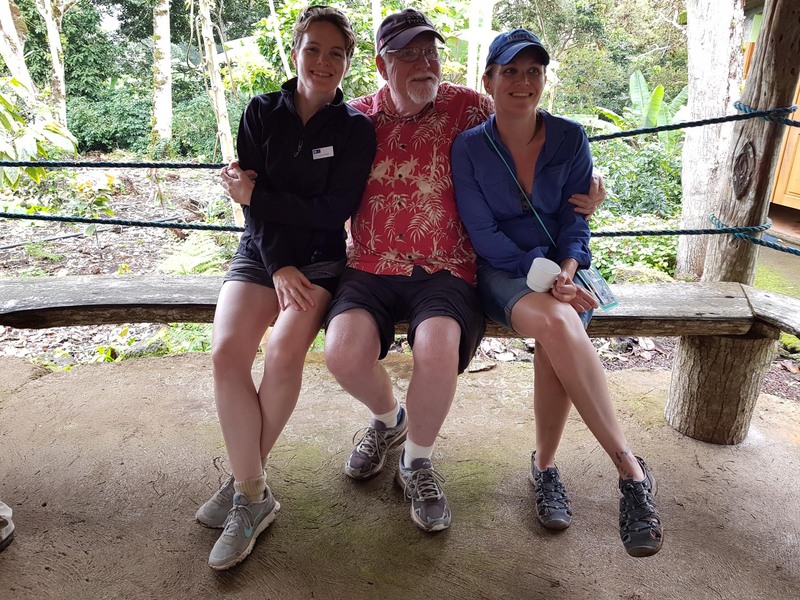 One had a background as a biologist, the others completed a training course for Galapagos guides. I would have preferred that all our guides had a background in science, and I regretted that our ship didn’t have a guide interested in birds, but that wasn’t promised. 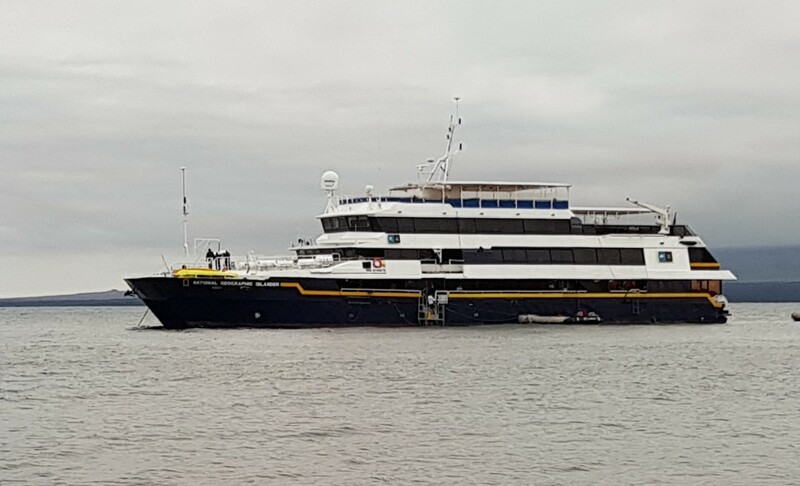 Our entire staff, guides, crew and captain were Ecuadorean–not a single American or Brit apart from the passengers. Now and then passengers filled in a word when the guide couldn’t come up with the correct one, but they got the job done. The staff was well trained and rapidly instructed us on how to do what was required. This included wearing life-jackets, how to board and disembark from small boats, where to clean swimming gear, how to make onboard purchases. Although we had a wonderful trip, why don’t I want to go on another cruise, ever? Most are built-in aspects of cruising that I would prefer to avoid if I have a choice. -The tour companies exaggerate, even Lindblad/Nat Geo. You’d think they wouldn’t need to. Our trip was billed as ten days and it lasted seven. They count every minute of travel as part of the tour, and it’s not. -On the final day of the tour, the seventh actual day, we were awakened at 6 am, told to have our luggage outside our doors at 6:15, given breakfast at 7 am and required to completely vacate our rooms at 8 am. Our flight back to Guayaquil didn’t leave until after 11 am. Why were we given the shove? Another tour was arriving on the plane we were taking back to the mainland and they needed time to spruce the place up. Wait! We were still guests! (No, by then we were nothing but outgoing flotsam). The final hour was spent in the lounge where a long loop of Lindblad cruise ads played. This was a tour day? Seriously? -The tour was very expensive. Yes, we got the best cabin, but even the least expensive cabin was costly. Yet every evening during the 30 minutes before dinner there was a “recap” that never reviewed the day. Rather, someone spent 20 minutes telling us about how much our donations to Lindblad/Nat Geo organizations are needed. We had to sit through this to get to the final ten minutes before dinner, when they told us the details of the next day’s events. These are not provided in advance, so that you don’t forget, and so that you attend the briefing. It was a frustrating experience. We weren’t the only ones with a newspaper or crossword. -Tipping. I hate the common practices of cruise tipping. I’ll leave it at that. -Begging. We were all asked to donate at least $500 to the Lindblad/Nat Geo good works funds. -Food. My husband is a fabulous cook and I am utterly spoiled. Only rarely are meals out better than what I get at home. Ending on the bright side, here are some of my favorite photos from the trip. 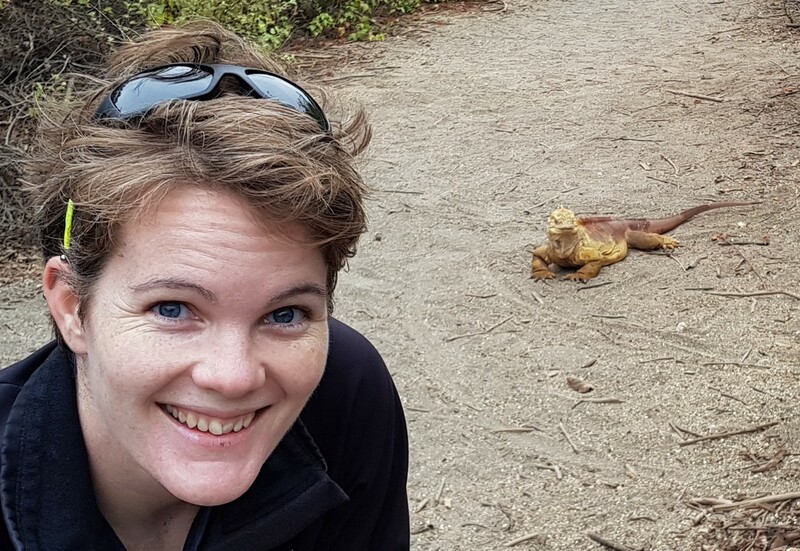 What makes the Galapagos strange is not the variety of birds and animals. Most are familiar. Pelicans, cormorants, and other seabirds are in the air, sea lions and iguanas on the beach, turtles in the water. 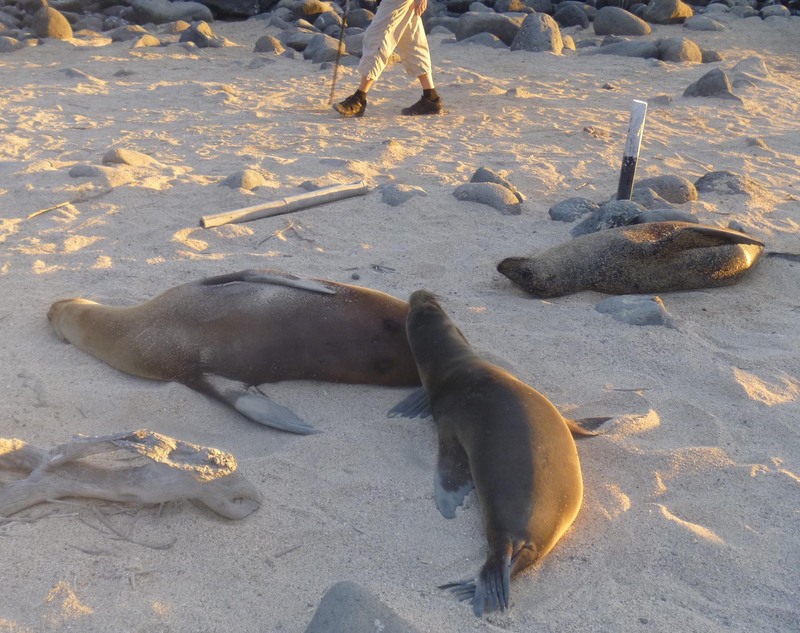 We’ve seen these before, on beaches and in documentaries about the Galapagos. It’s their indifference to us. We ride by sea lions in the zodiacs, and we swim with them. 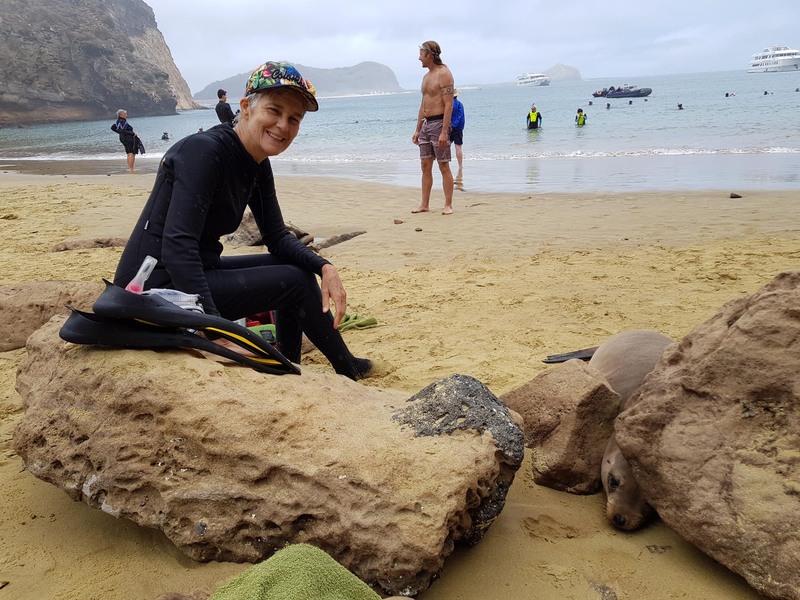 Young sea lions are curious about us and circle as we snorkel, they dive and approach, they hang upside down, even blowing bubbles in the faces of some lucky swimmers. The sea lions flop around in the surf while we stand in the water only a few feet away, they loaf on the rocks as we hike along the beach trails. In the water with our snorkeling gear, penguins come in for a dip, though they zoom by so fast most people don’t see them. Cormorants and boobies dive for fish just a few feet away. 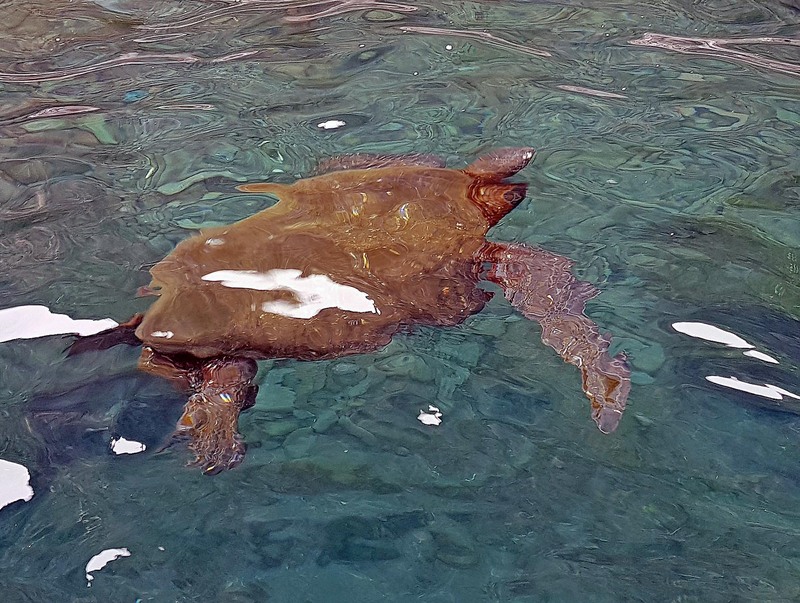 One day we swam in an area where sea turtles were stacked four deep, just hanging in the water. The largest tropical fish I’ve ever seen swim around and below the turtles and sea lions. Some move like flocks of underwater sheep, grazing across the bottom, lazily waving their bright yellow triangular tails. Visitors may not touch any of the animals, but animals may brush against visitors and that’s a bit unnerving. What happens when a turtle wipes their shell on your chest, or kicks you? 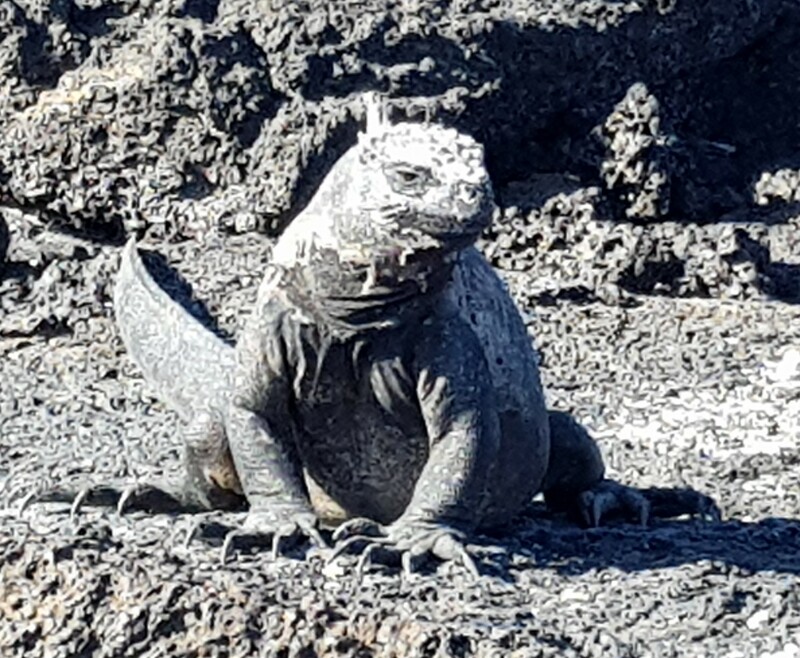 Do we want to swim along with marine iguanas? The iguanas don’t dog paddle with their tiny claws, but propel themselves along with their tail, like a snake. On shore, they pile up against one another in huge clusters. The water is breathtakingly cold and an hour is as much as anyone can take. Snorkelers put u p a hand to be collected by the boatman. We swim toward the zodiac, the ladder is lowered. We hand in our fins and climb out of the water, get a towel and sit on the black rubber surface, enjoying the heat it has absorbed from the sun. We may sip from our metal water bottle as we wait for the others. 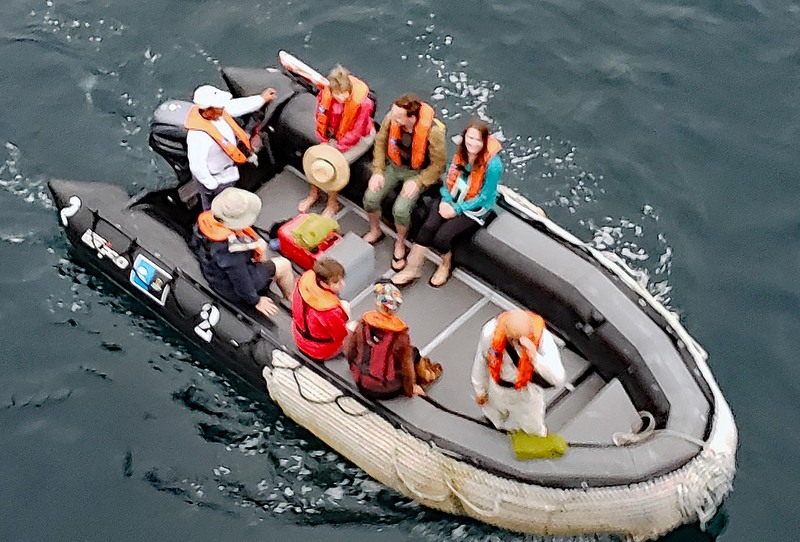 When everyone is back on board and our life jackets are on, we head to the ship where we disembark one at a time, wearing our mesh bags of gear so that our hands are free to grab a hand or railing and haul ourselves onto the ship. On a side deck we begin to shed layers of protective gear, rinsing mask, snorkel, fins, wet suit, and then hanging it all up. More flights of stairs to our room to shed the rest of our layers in the hot shower. Once dried and dressed, the wet gear goes back down to the spinner to squeeze out as much water as possible. There may be more snorkeling in the afternoon and we want it to be as dry as possible. Once all the gear is settled, we go for the drinks and snacks set out near our entry point to the ship. The process has taken a while, giving each person time to contemplate what they’ve seen as they transition from sea to land. For me, snorkeling is a high point, and also the most taxing activity. I wear all the layers I have available: bathing suit, leggings, full body thin wet suit, shorty neoprene wet suit, dive socks, headcover. I wish I had gloves–a complete water ninja. As soon as I get in the water, I make fists and tuck them under my arms to keep my fingers warm as long as possible. I move with my fins and keep my hands tucked in, taking in the view without uncoiling my arms, trying to keep warm as long as I can. Even with all my layers, a wet suit can only keep me warm for about thirty minutes. After that, I either grit my teeth and keep swimming, or I raise my hand and head back. I don’t mind waiting for the others, it is comfortable bobbing with the zodiac, watching for penguins and turtles. I can barely believe I am in the Galapagos Islands, as seen on TV. This week, my life could be narrated by David Attenborough. A segment of his documentary of the islands is shown each evening. 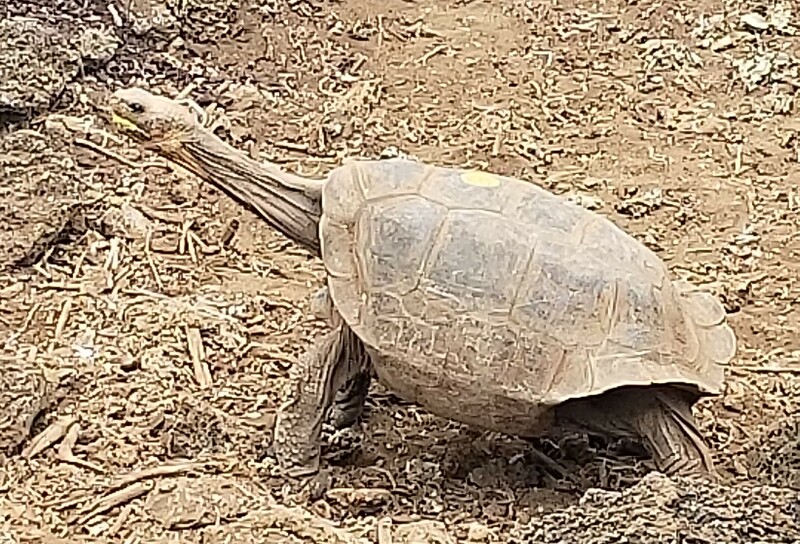 Lonesome George wannabe sticking out his long neck. Even on land, this trip is a bit surreal—we are really here in the land of the giant tortoises. We walked by two of them on a hike and they blandly watched us as we stared at them, then turned and crept into the bushes when they’d had enough. 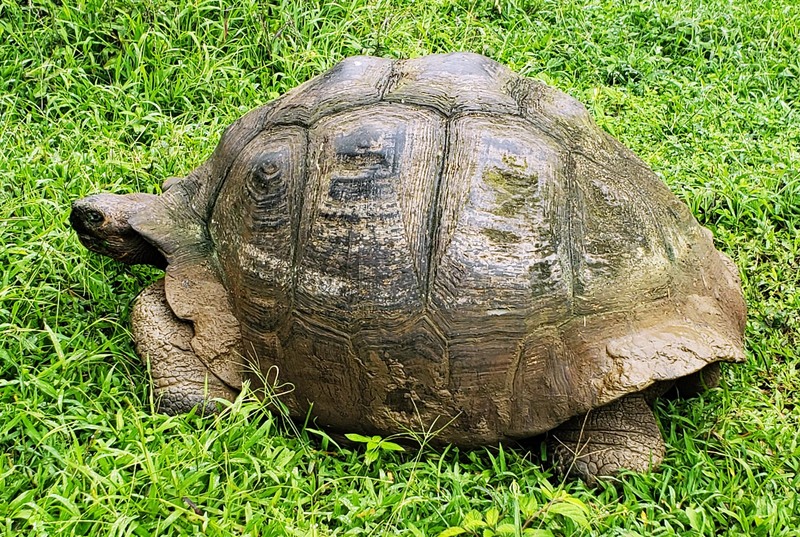 At the Charles Darwin Research Center, we saw tortoises born this year, just a few inches across, and groups of larger and larger sizes. Tortoises are not released into the wild until they are around 25 years old. 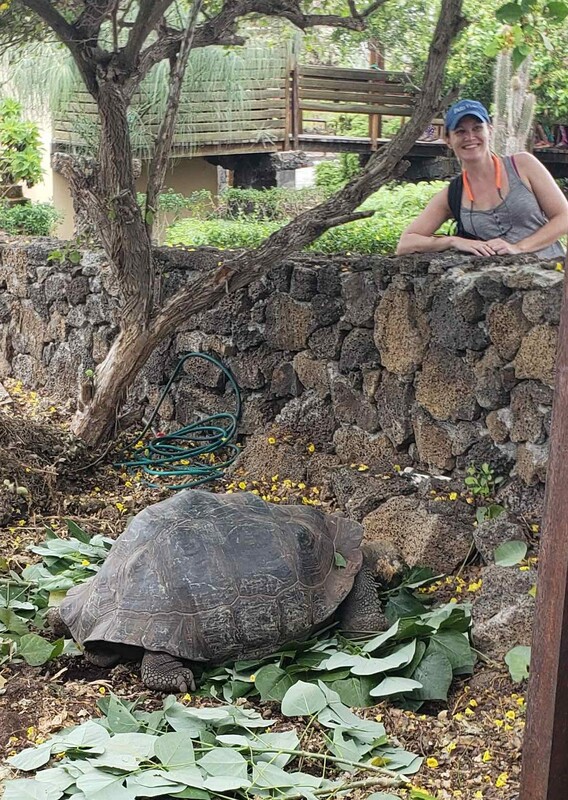 Lonesome George, the last surviving Pinta Island giant tortoise, has a place of honor at the center. Since his death in 2012 at the ripe old age of 100+ he is a taxidermied specimen, posed with his long neck extended as though nibbling at leaves on a bush. He left no offspring, but don’t worry. 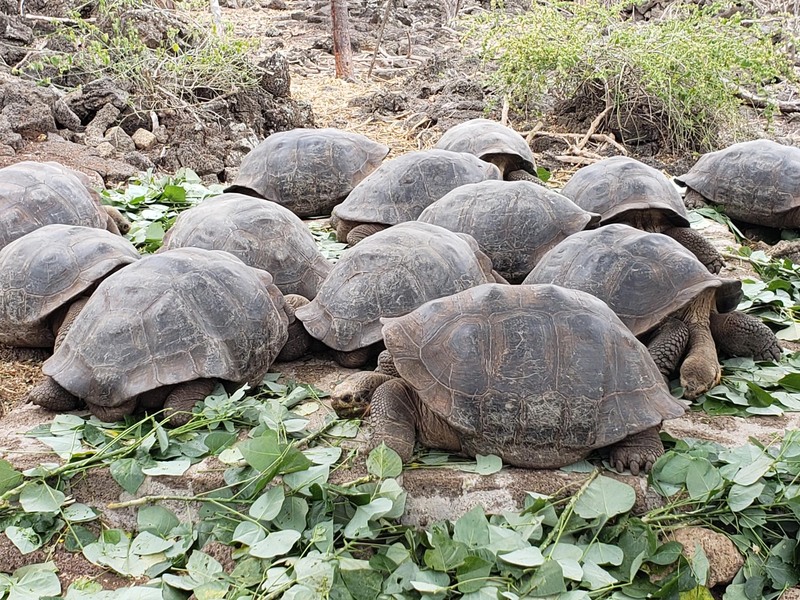 Another tortoise, SuperDiego, has 1000 offspring and counting. 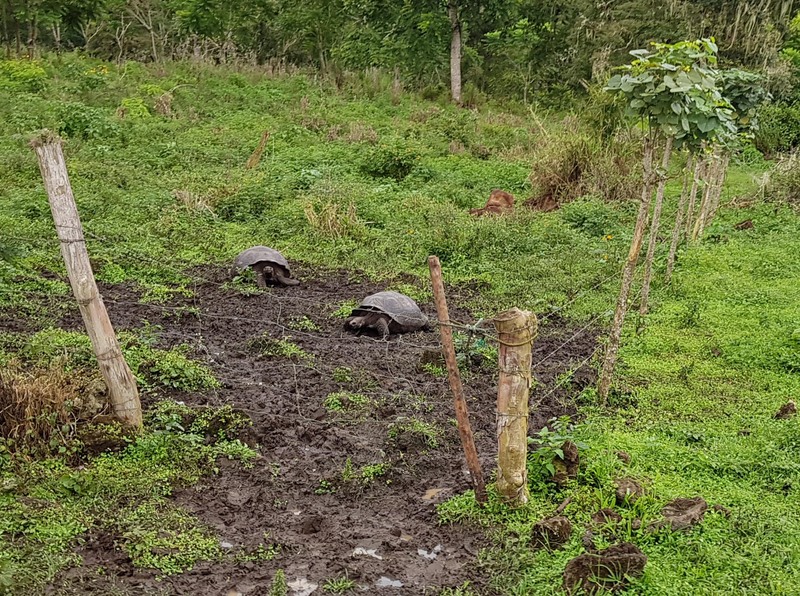 We visited tortoises in the highlands of Santa Cruz Island, where they roam very, very slowly around cattle pastures, or what look like pastures. Some have numbers that were carved into their shells years ago, before the development of RFID tagging used now. They ignore us as they munch methodically on grass, leaves, and branches. We tried not to step on them or trip over them. The land iguanas were not troubled by our group of visitors at all, and sat unmoving in the center of the path. We tiptoed around them and continued on our way, circling the next one, the next one, and the next. The lack of fear in creatures, and the multitudes of them, is what makes the Galapagos remarkable. Birds, iguanas, sea lions, sea turtles, and tortoises permit us in their environment rather than hiding from us or running away. Anywhere else, they would be rare or extinct. In the Galapagos, the animals turn their cold eyes on humans and are unimpressed. 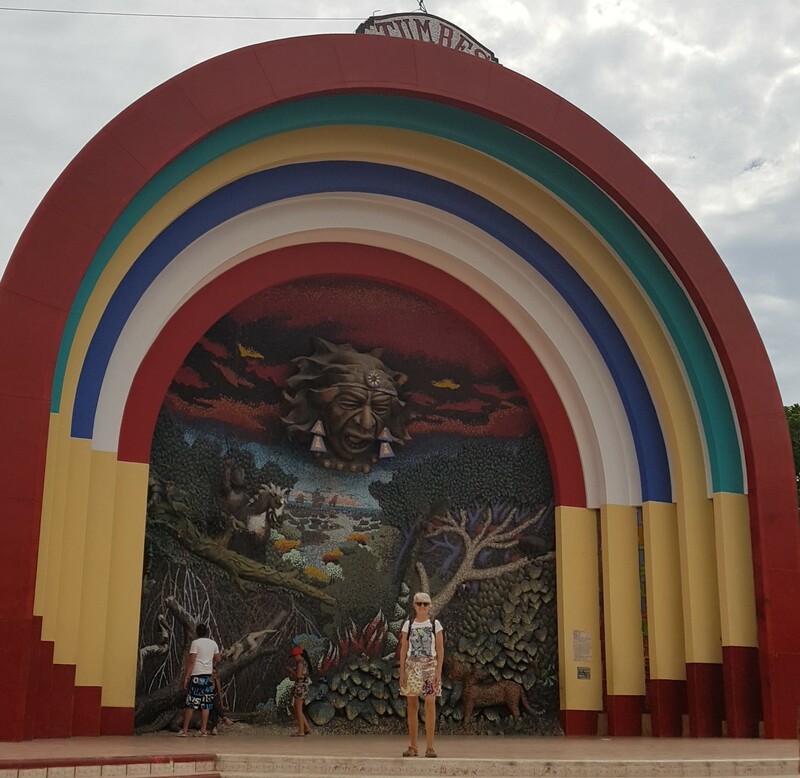 We went to Tumbes because it was there. We said we were going to northern Peru and that’s as north as it gets. 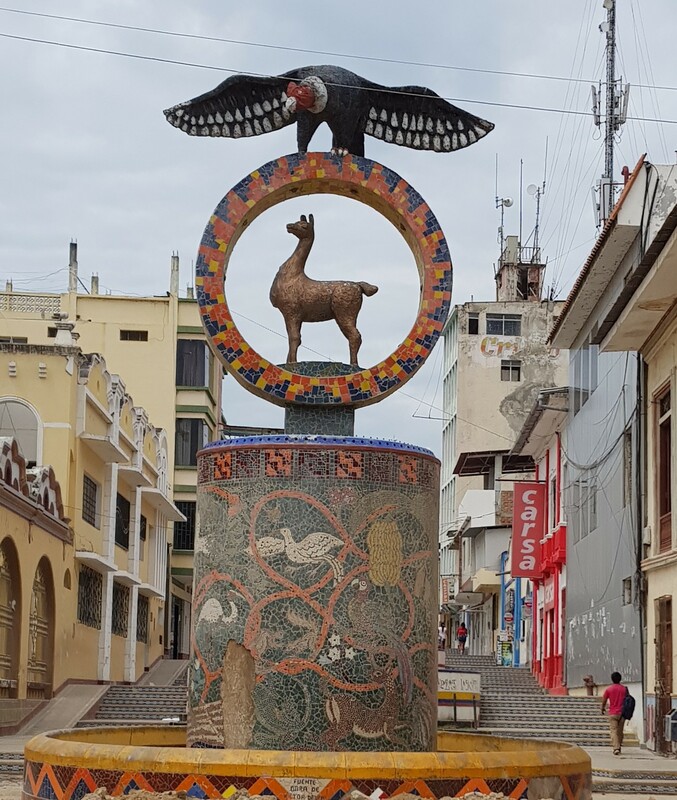 The Plaza de Armas has two elaborate monuments facing each other, a condor and llama on one side and a giant band shell filled with faces and figures on the other. I’m not sure I’ve seen another civic monument quite like it. 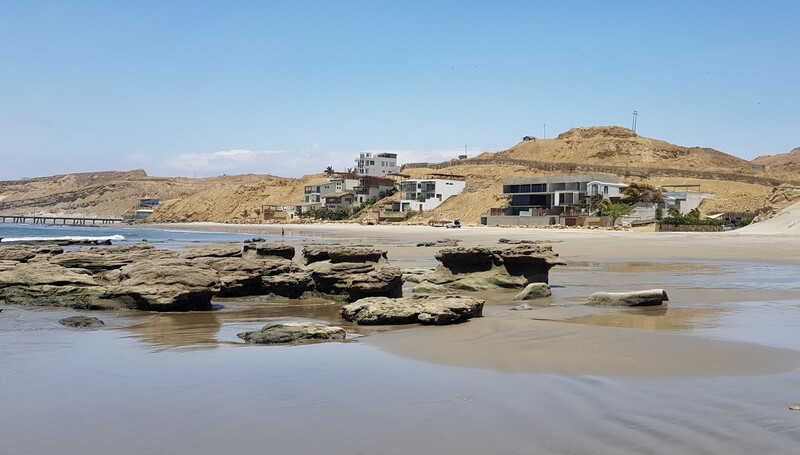 We had lunch in Tumbes at Eduardo El Brujo, ceviche and fried calamari. The restaurant is upstairs around the corner from the Plaza de Armas. To make sure that clients get there, several people stand in the street indicating parking spaces and showing visitors where the door is located. We were interested to see that on the day we visited, most of the diners were locals having business lunches. No one drank alcohol with their meal, though having a beer or two with a seafood lunch is normal for vacationers. 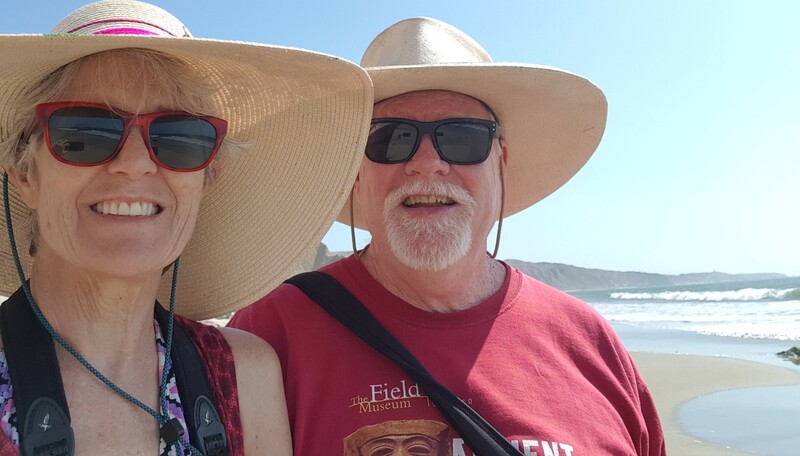 We stopped at Puerto Pizarro, the supposed site of Francisco Pizarro’s entry into Peru, the first step in a chain of events that devastated the Inca Empire. Lowlife Pizarro and his brothers melted down Inca treasures to make ingots. They had no sense of history, and no recognition of other cultures. We’ll never know for sure what they melted down, rumored to include an entire garden made of gold and silver. Puerto Pizarro is the launching spot for tours of the Tumbes mangroves. We preferred to do our birdwatching from the shore and saw enough to keep us looking. 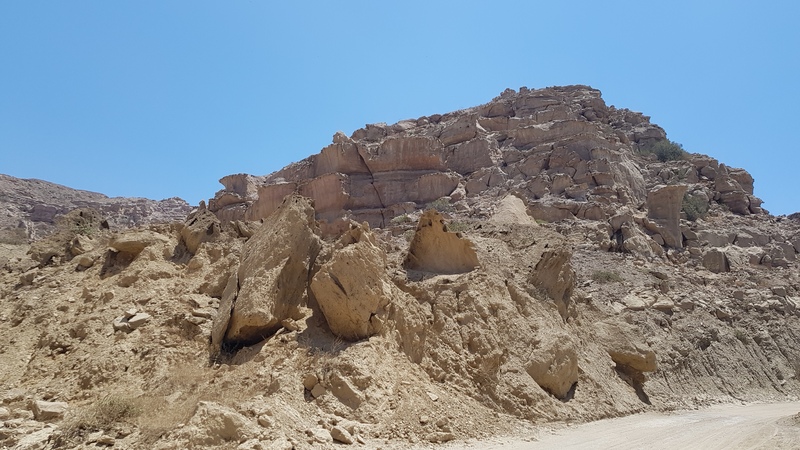 The next day we went south along the coast on an unpaved road that runs from Playa El Nuro past Cabo Blanco. We had been to lunch at the excellent Cabo Blanco restaurant with neighbors from Playa Los Organos, Darryl and Arla. They invited us over to chat on our first day in the area. They built a house about ten years ago and it now is surrounded by a lovely garden area. We decided to go to lunch together and they introduced us to the Cabo Blanco area. Our return trip was a chance to walk on the beaches. Some of the coast is very rugged, with natural terraces of rock extending up the hillsides. For now the shore is still largely empty and untamed, though that may change as new houses and hotels are being built all along the coast among the folds in the hills. Our hats are now so big that there is hardly any room in a selfie for anything else. This week has been much hotter around Playa Los Organos than in Barranca. Hats keep the sun off and that’s what’s important. We could have continued down the beach indefinitely, collecting driftwood and seashells, cooling off now and then in the ocean. Having a guest really gets you up and going. 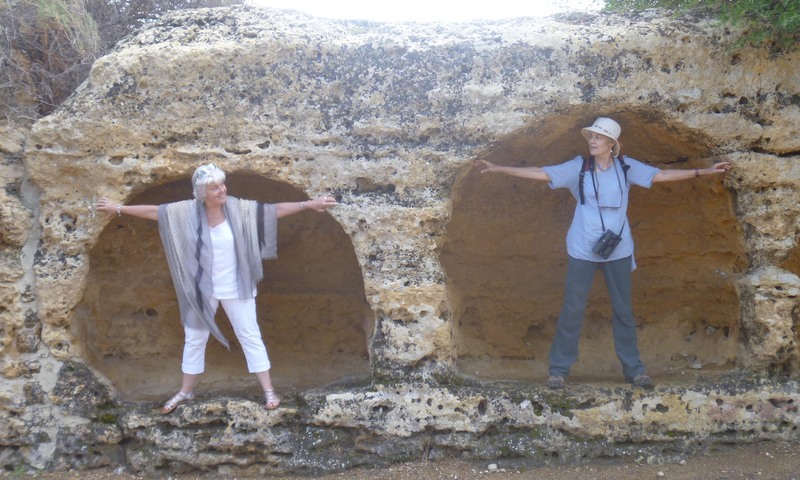 With my sister Catherine we hit high spots of the region so that she could take away a sense of western Sicily. 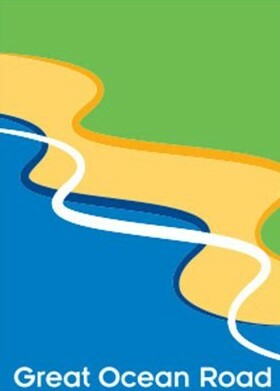 Three themes emerged, landscape, beaches, and archaeology. Sicily’s landscape is Dramatic. 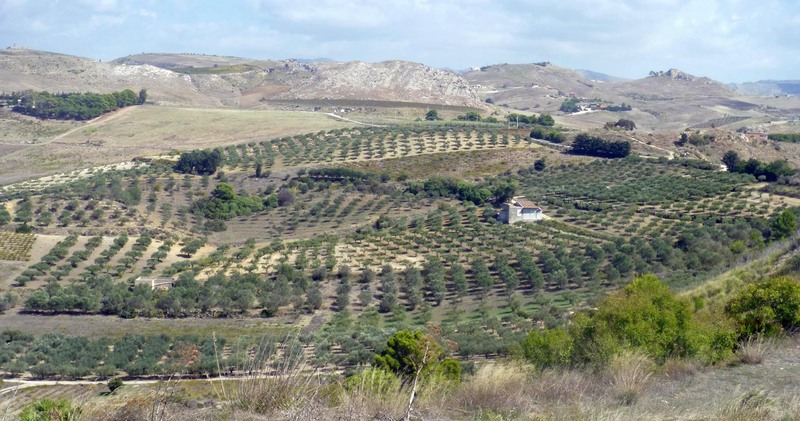 Huge rocky hills emerge from the sea, yet just beyond are broad plains of wheat in one area, olives and grapes in the next, then the dark green citrus leaves of lemons and oranges. 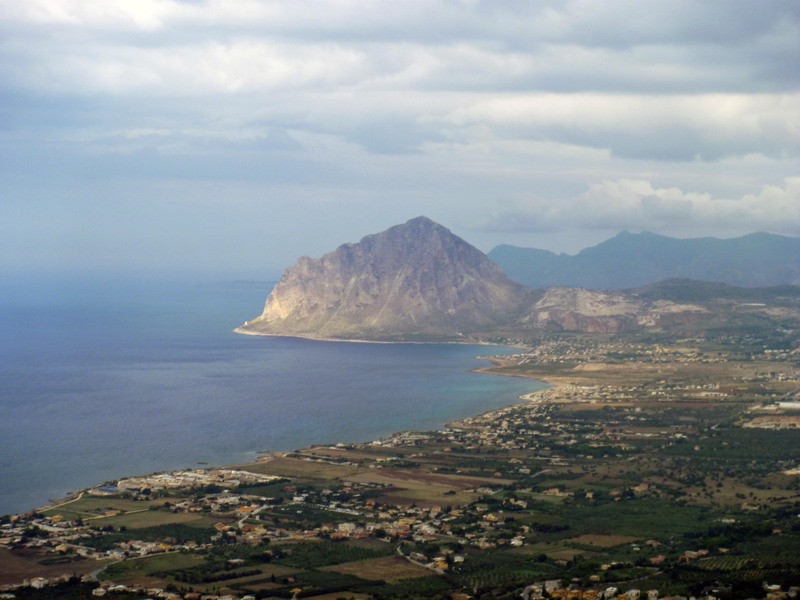 The nearest airport to us is Palermo, located on a huge bay called the “Golden Shell”. From there we visited Erice, a tiny town outside Trapani that is perched on a high hill. Its medieval streets are largely intact, and the view out over the coast and the Mediterranean is superb (see opening photo). 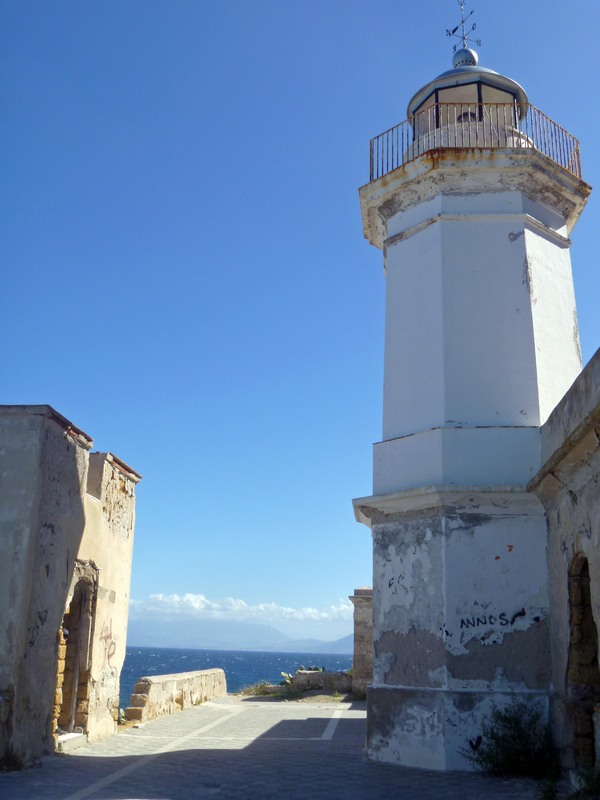 On another day we went to the opposite side of the Golden Shell to Punta Zafferano. We saw the sea up close, where an abandoned lighthouse presides over the rocky coast and the waves plunge, swirl and surge onto the rocks. The “road” narrows to the width of a cart. Fortunately we were able to make about a 37 point turn and park, so that we could have our picnic. Opened the trunk to find that the picnic was still on the table at home…. “Forced” to eat out, we asked help from a woman we saw in nearby Porticello, and she led us to the improbably named Gasthaus Grill, where we had excellent seafood pasta. Other days led us to the beach. The beach closest to our house is San Marco, but based on the recommendation of our host, Stefania, we went to Aloha Beach a bit further along. 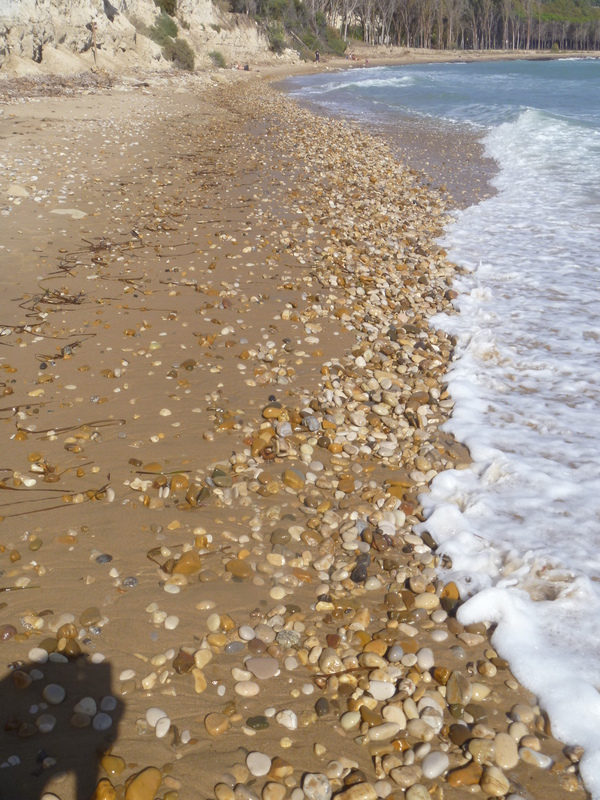 It was good for a swim and had great beachcombing; we found beach glass and intriguing colorful pebbles and sandstone carved into fantastic shapes by the wind and tides. 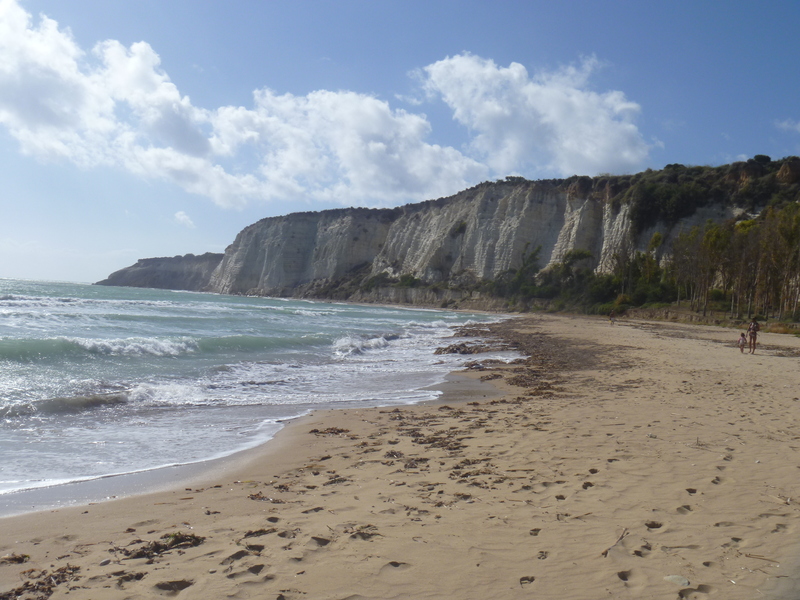 In tandem with visiting an archaeological site we stopped at the beach in Eraclea Minoa, and combined marveling at the chalk cliffs (2nd photo above) and beachcombing followed by drinks on the terrace of Garibaldi, a restaurant/bar/beach club still open at the end of the season. The high tide washes under the building so you feel that you are on a ship. 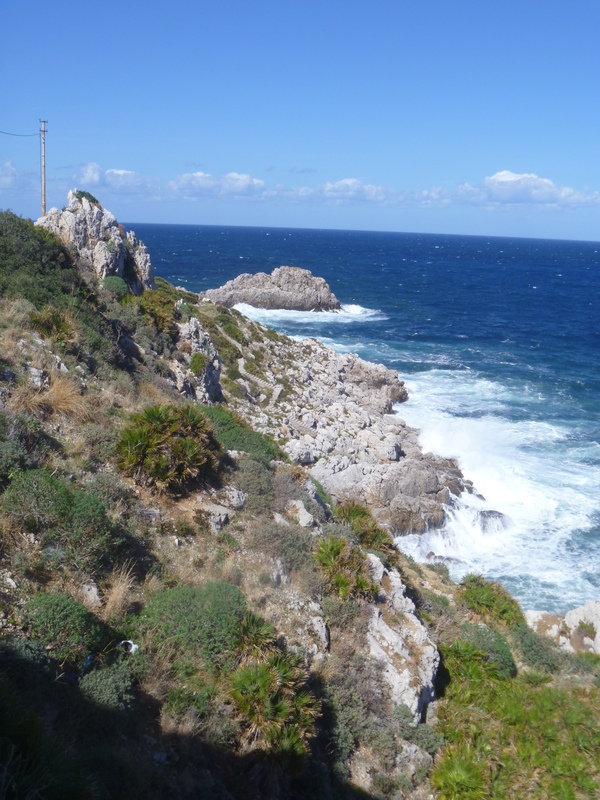 So far we have been to three of the beaches along the Mediterranean coast. We look forward to seeing many more of them. 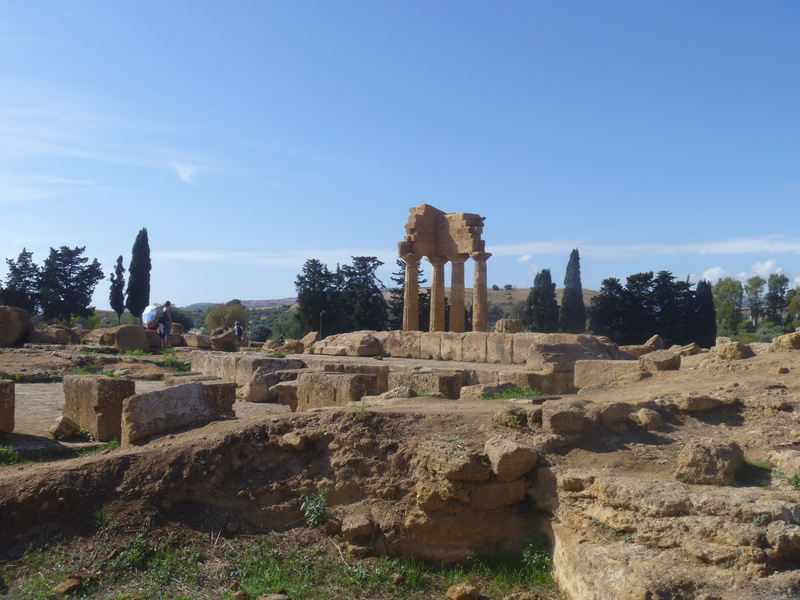 The other resource found everywhere in Sicily is archaeology, and in this Sicily shines. 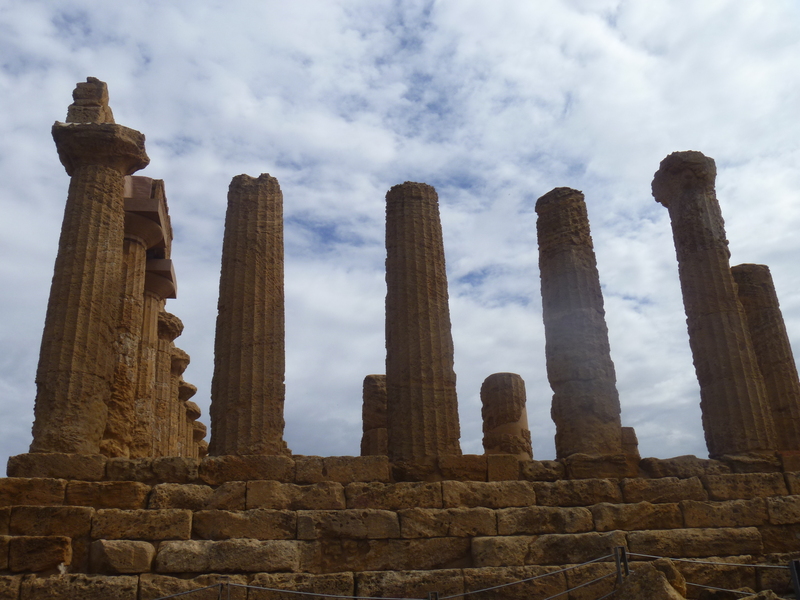 There are many Greek temples on the island, and other layers of history as well, from the Elymi, the earliest named people, to the Greeks, Punic (north African), Roman, Byzantine, Muslim, Viking, Norman, Angevin (French), Aragonese, and Bourbon (Spanish), We began with the biggest and most impressive archaeological site in Sicily, the Valley of the Temples at Agrigento. 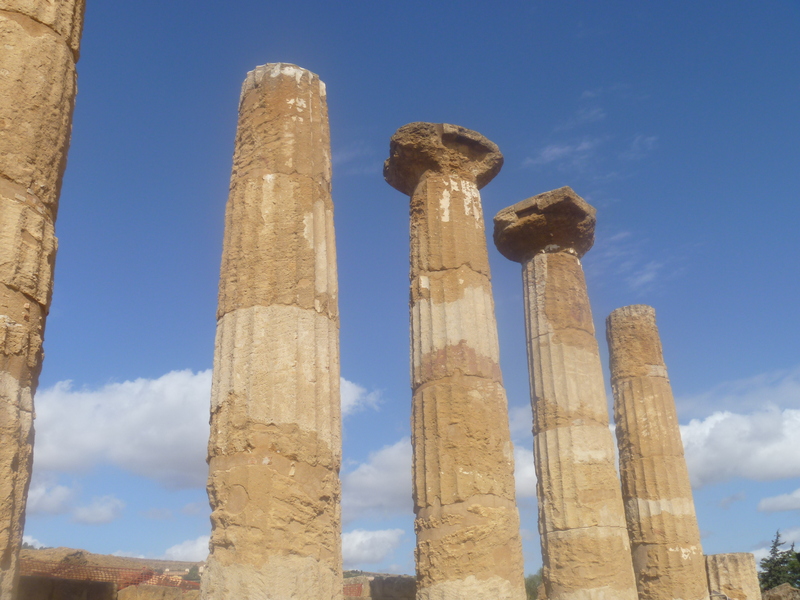 Great trivia: The Temple of Concordia at Agrigento is the source of the logo for UNESCO World Heritage sites. Agrigento is the most visited site in Sicily but was not nearly as crowded as some of the places we visited near Naples. 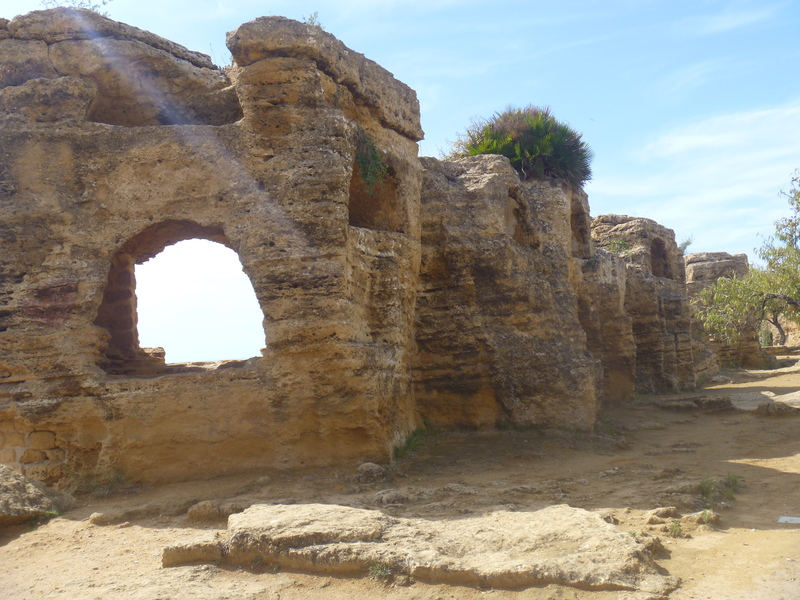 Called the Valley of the Temples, it has five Greek temples built along a ridge overlooking the sea. The Temple of Concordia is most complete, and the others range from nearly complete to a heap of column fragments. A huge wall along the ridge was honeycombed with tombs carved at a later time. These are some of the innumerable tombs that were carved out of the old city walls. Many were so full of tombs that sections collapsed. These tombs are all shapes, from small boxes to large domes. The Temple of Concord is the best preserved, but the other temples are imposing. 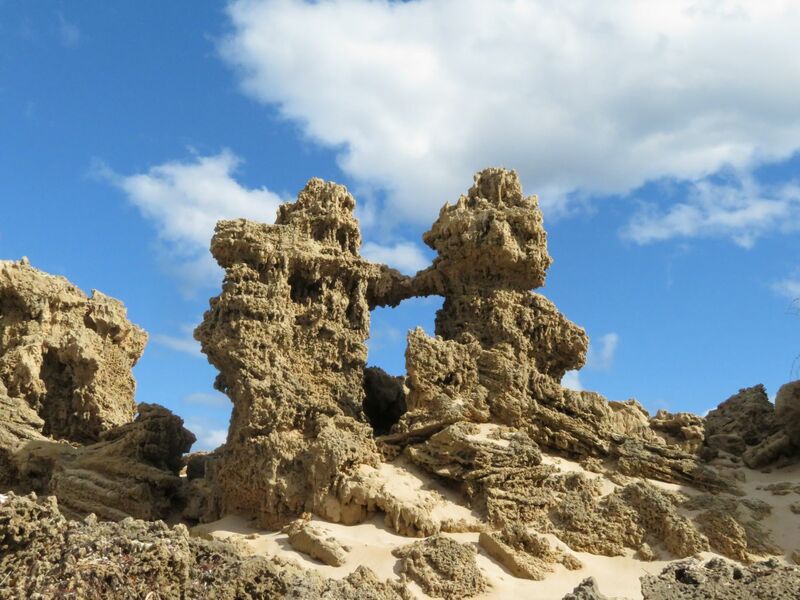 There were piles of broken columns, and broken segments with deep U-shaped grooves in them. I don’t know what they could have been used for. We also visited the site of Heraclea Minoa, a huge valley covered by an ancient city. Most of the site remains unexcavated, and here you see the competition for attention among archaeological sites. 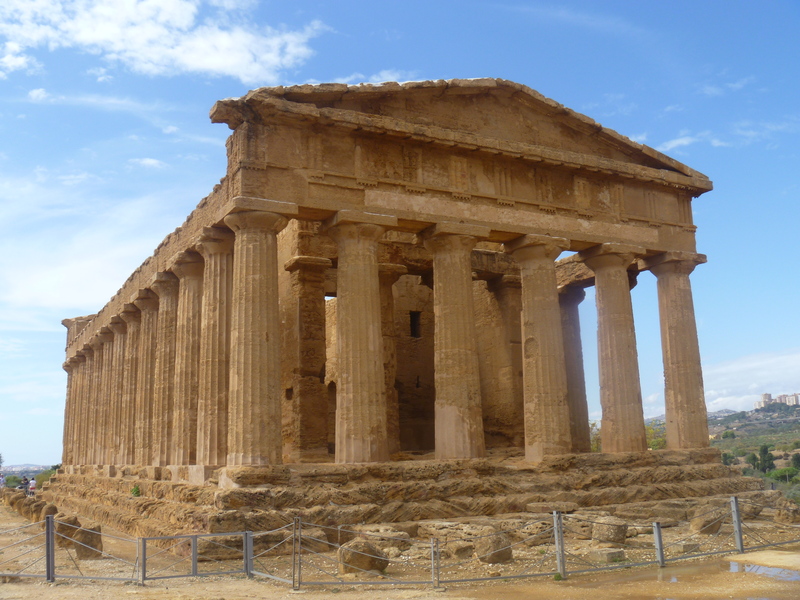 Agrigento is the most visited archaeological site in Sicily and who can match five Greek temples? Heraclea Minoa is extensive but not as attention getting as Agrigento. It has far fewer visitors as a result and is also not as well kept up. 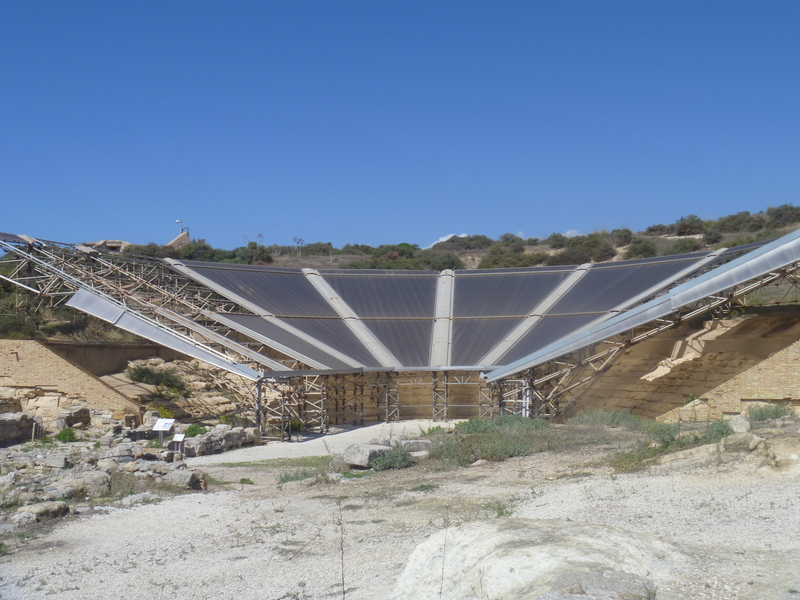 The cover over the amphitheater at Heraclea Minoa reminds me of a scene from a James Bond movie. For the moment, these are the three axes of Sicily: landscape, beaches, archaeology. We’ll see what happens next week. I’ve been lax on posting lately and will now catch up by posting a few pictures from some of the places we’ve enjoyed this month. 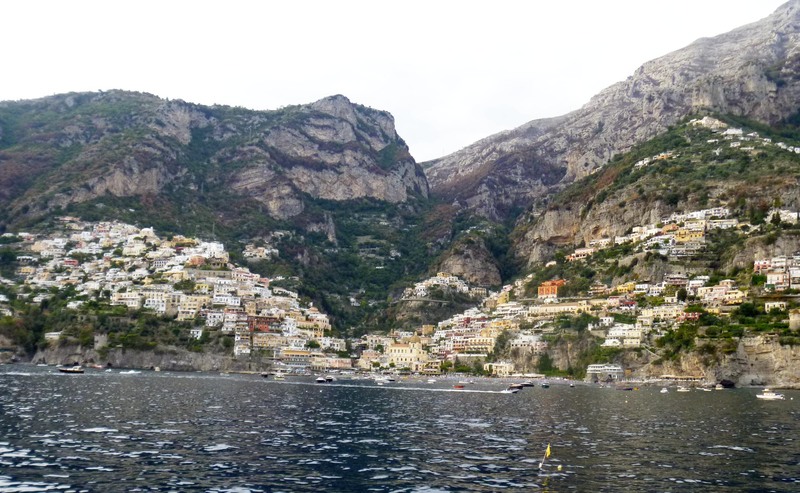 Taking the ferry along the coast gave us a great look at Amalfi and Positano from the water. The ferry stops at both places on its way to Capri. 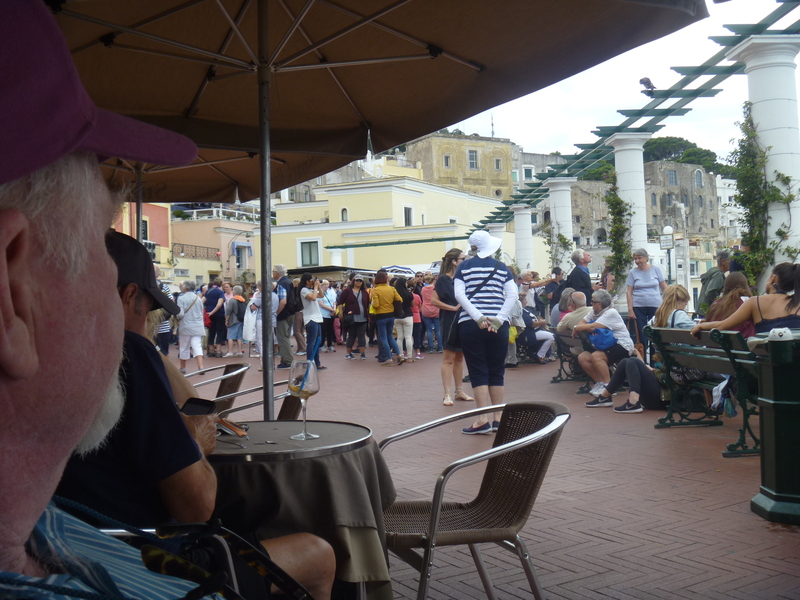 We stopped for coffee when we first arrived on Capri and sat sipping while we looked out over the busy harbor at Marina Grande. Before we left, we stopped for a spritz at one of the cafes off the Piazzetta. Again, we watched the many tourists and general bustle. Having read a few restaurant reviews before going out there, we decided to have a picnic lunch. People who have trouble walking up and down a lot of steps may not enjoy the Amalfi coast, but on Capri, there is a walk from the top of the funicular in the Piazzetta of Capri out to the Belvedere Tragara that doesn’t include a lot of steps. The view over the rocks “I Faraglione” is stunning and there are some patches of light blue water when the bottom is sandy that are straight out of the Blue Grotto. There are benches here and there so you can stop and savor the view and picnic. We did not visit the Blue Grotto while on Capri. This wasn’t restraint on our part, it was closed. 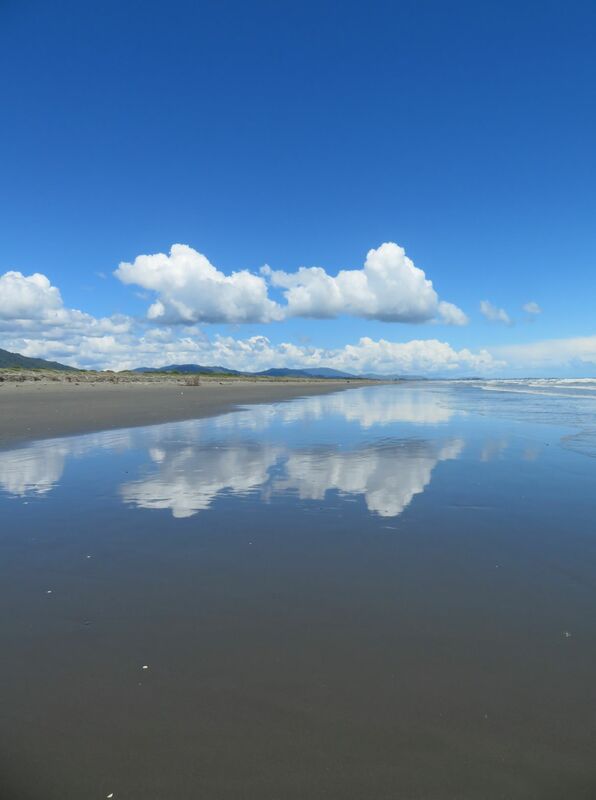 The entrance is only accessible at low tide with calm seas. Later, I heard people saying that the Blue Grotto was very crowded and there was a long wait. From what I’ve read the water is clear blue illuminated from below and objects immersed in the water look silvery or ghostly. It sounds like a magical place even with many other visitors. It takes a full day to visit Capri whether you start from Naples, Sorrento or Salerno. Our ferry left at 8:40 am and we returned to the landing about 6 pm. We took the ferry from Salerno, 1.5-2 hour trip depending on conditions, €26 per person plus fees. The funicular from the ferry landing at Marina Grande, Capri, to the town center was very crowded (€2 per person each way), but better than walking. There are also buses, just as crowded. All vehicles on Capri are mini-sized. High end shopping is a serious activity on Capri. Every designer you’ve ever heard of has a store there and there are quite a few fine jewelry and watch stores on the streets radiating out from the Piazzetta. Boat trips around the island start at €18 per person in an open boat with about 25 people, to private charters at €250 and up per boat that can include a stop for swimming. All tours include a stop at the Blue Grotto if it is open. The Blue Grotto is €14 per person in a small rowboat. 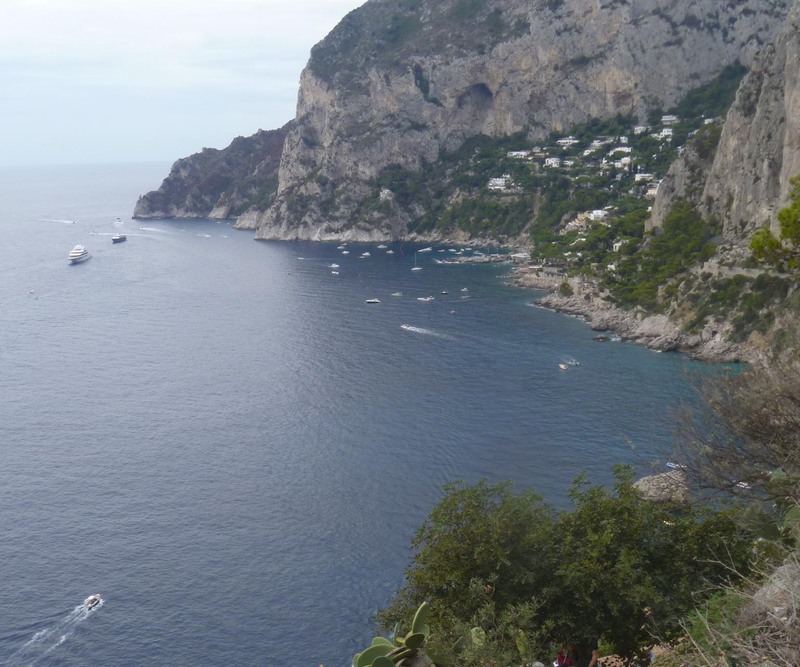 There are walks available on Capri if you stay longer than one day and have good stair-climbing ability. The island has a few tiny coves where you can rent lounges and umbrellas and take a swim. Remember that when Italians say “beach” they don’t mean sand they mean sunbathing. If you stay longer than one day, you might visit the second town on Capri, Anacapri, a short bus ride from the ferry landing. 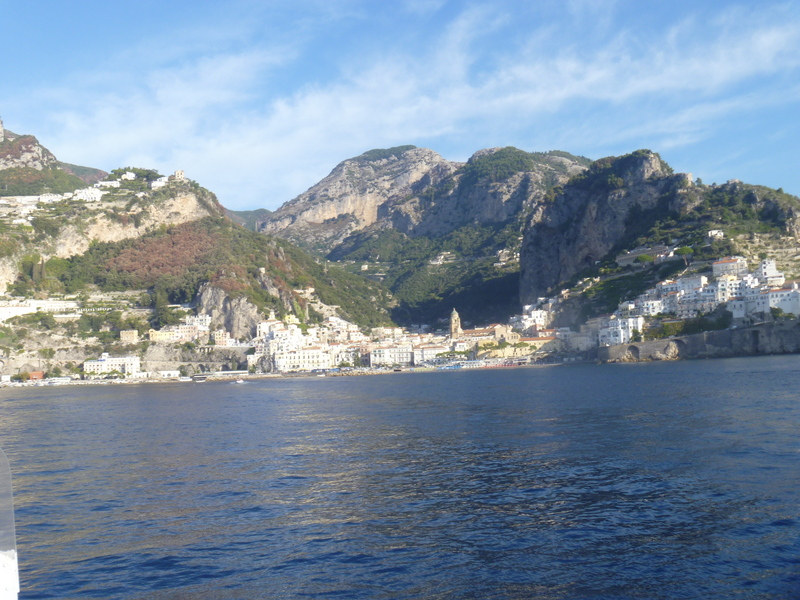 We returned on the ferry, enjoying one last view of Positano and Amalfi, like tidepools caught on the rocky coast.